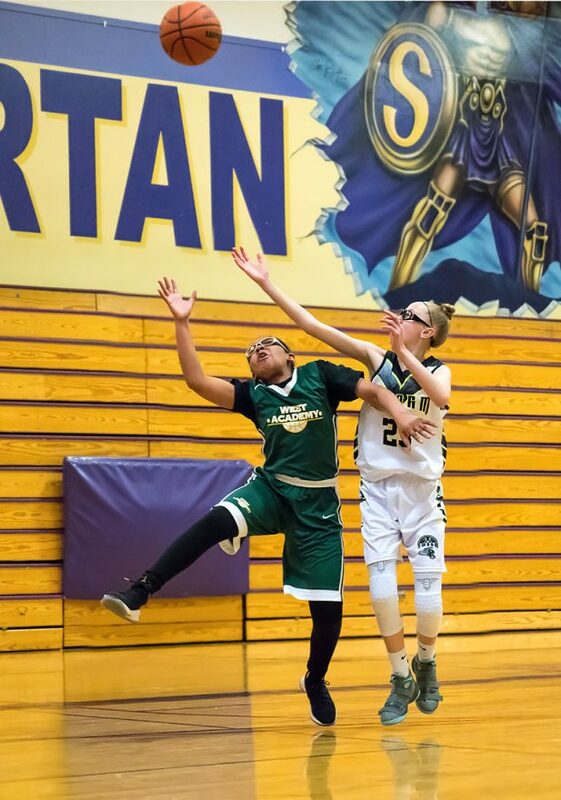 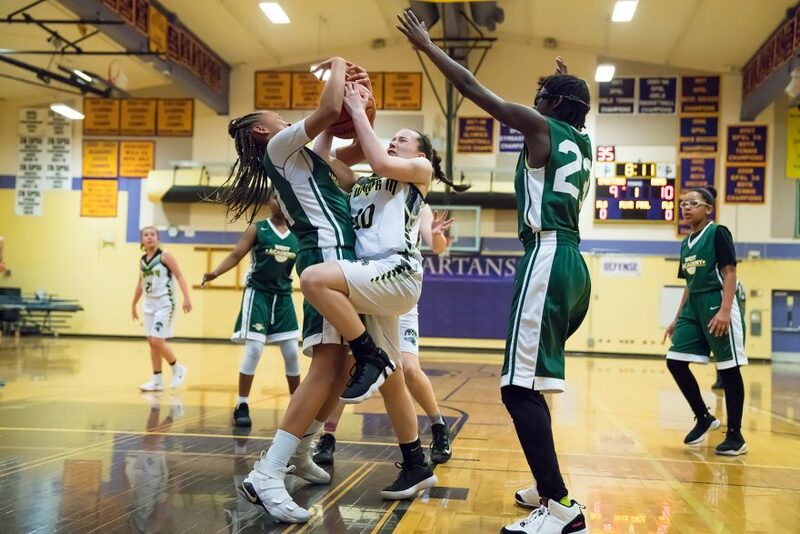 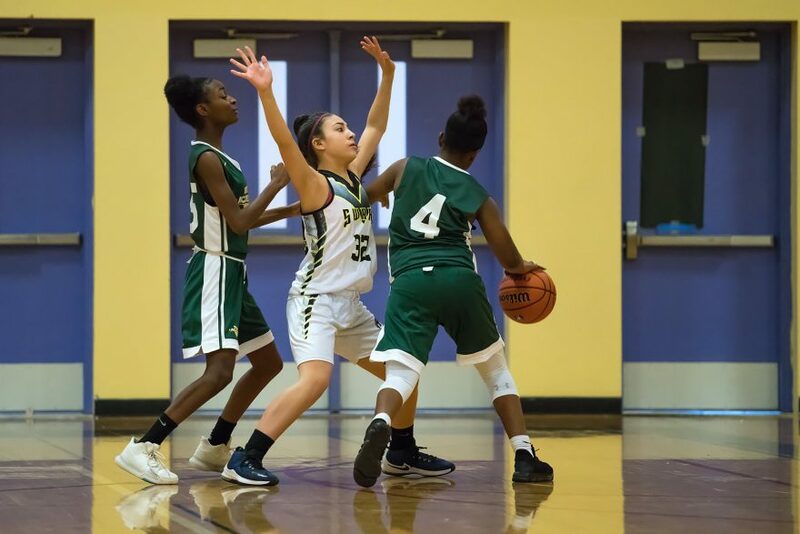 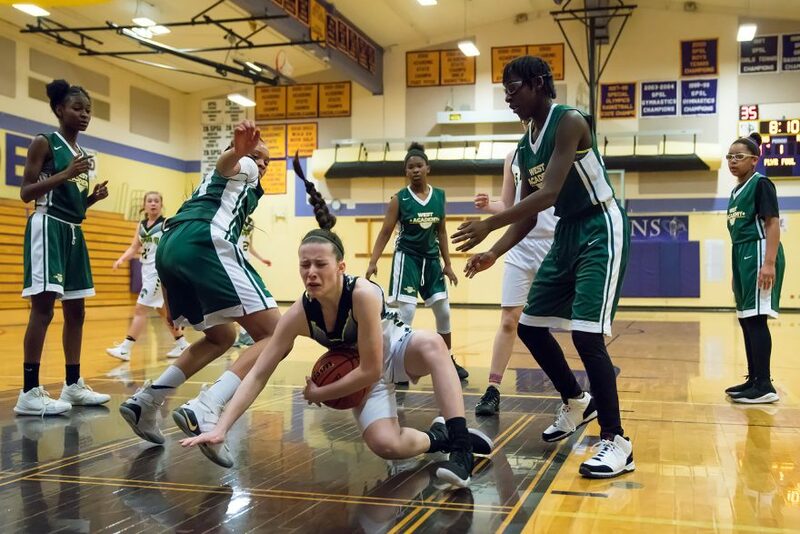 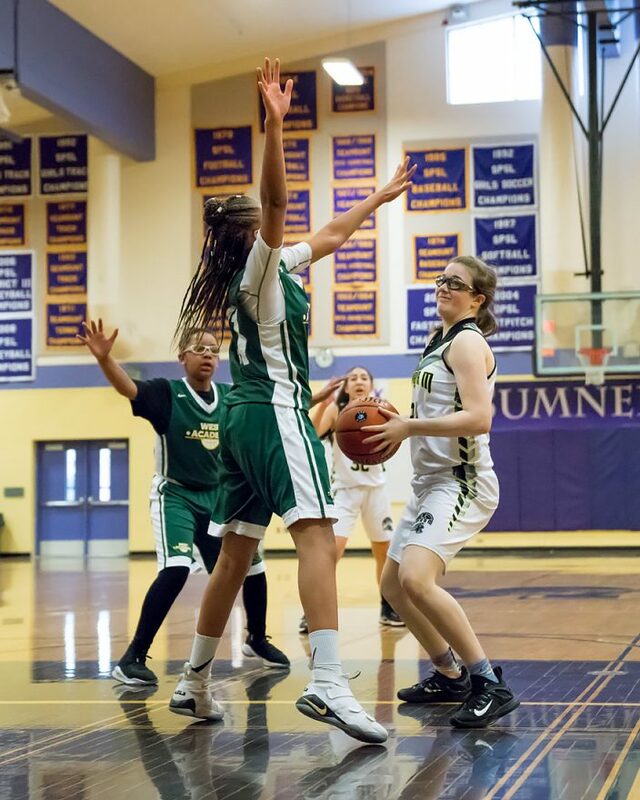 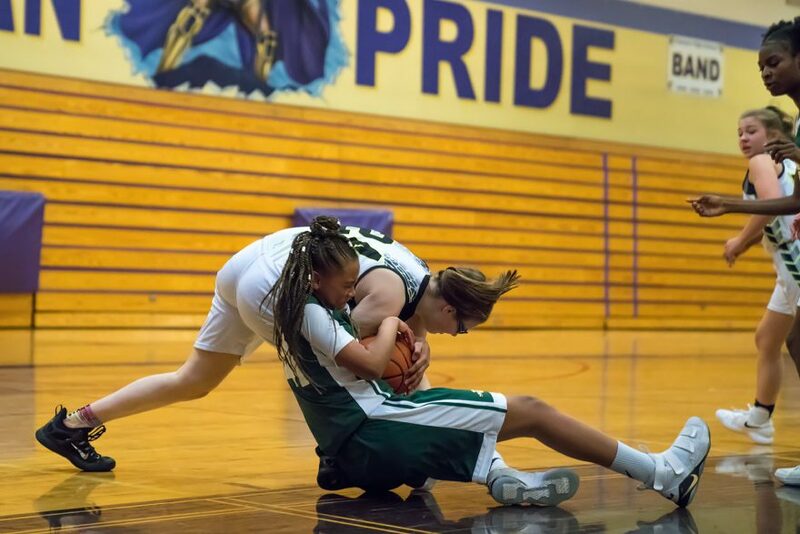 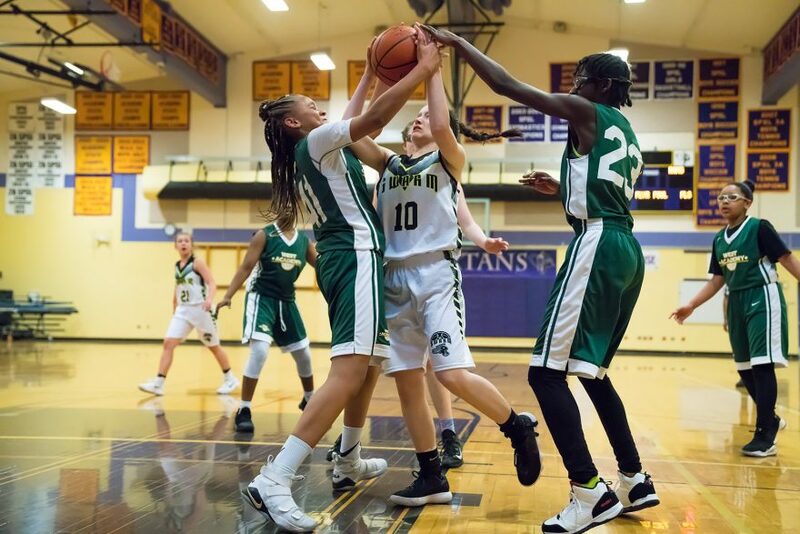 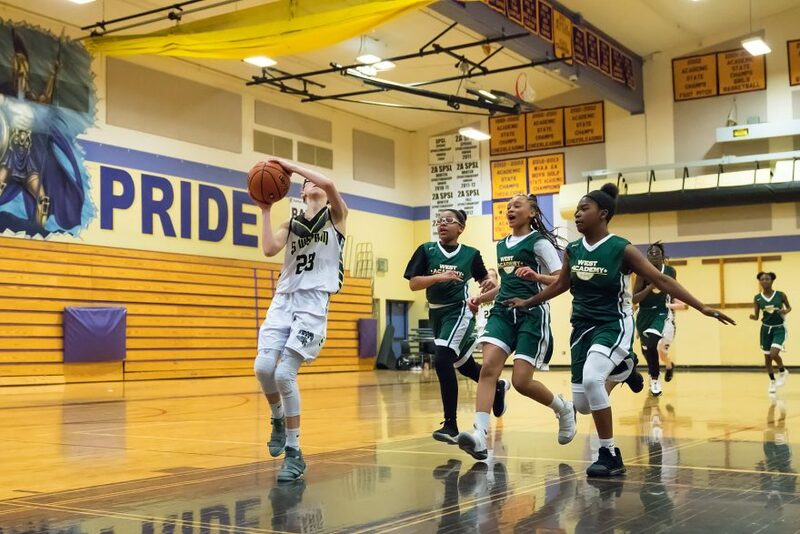 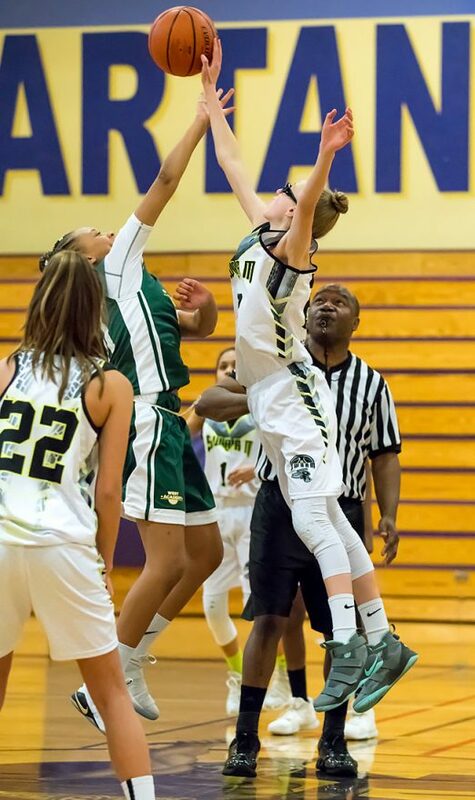 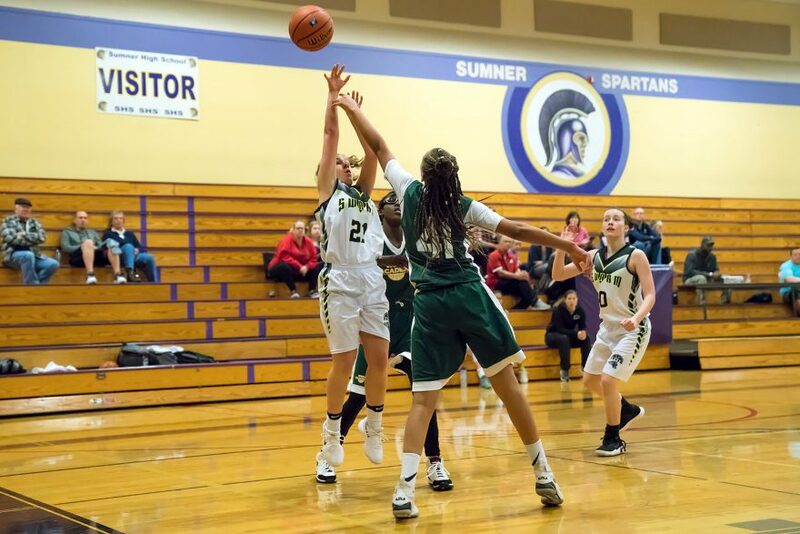 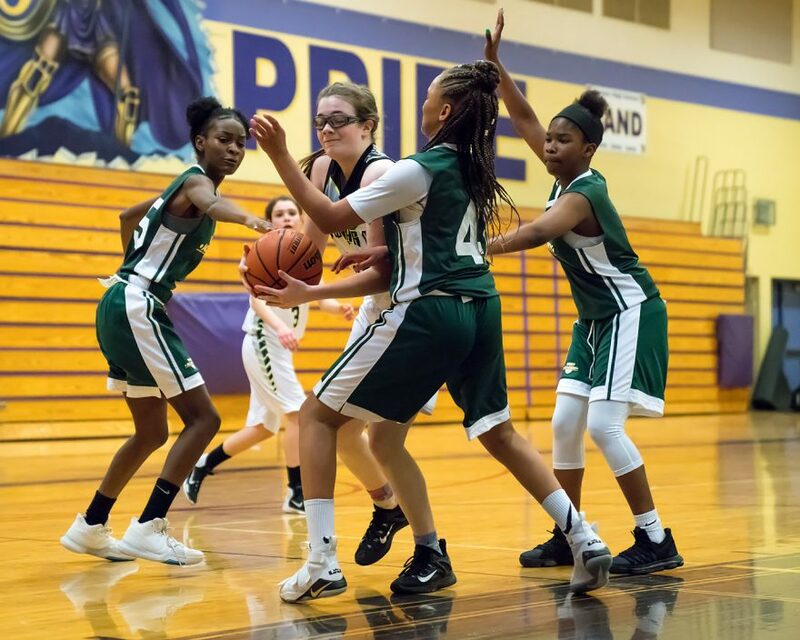 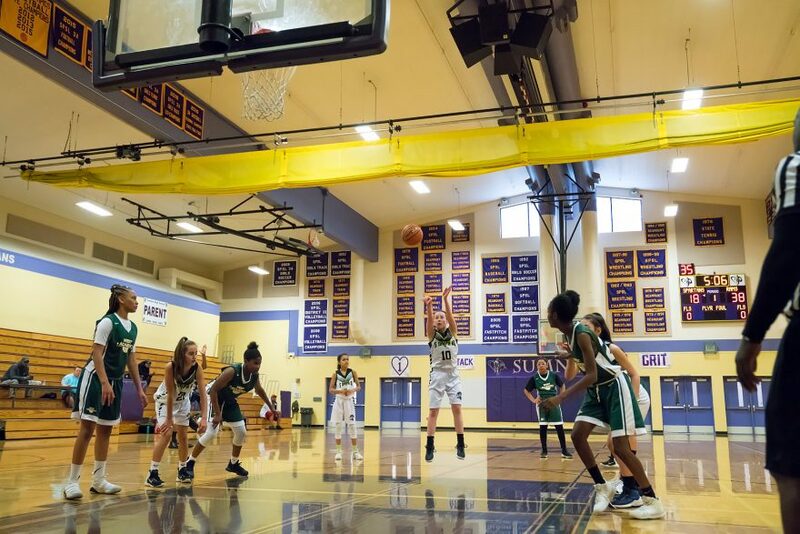 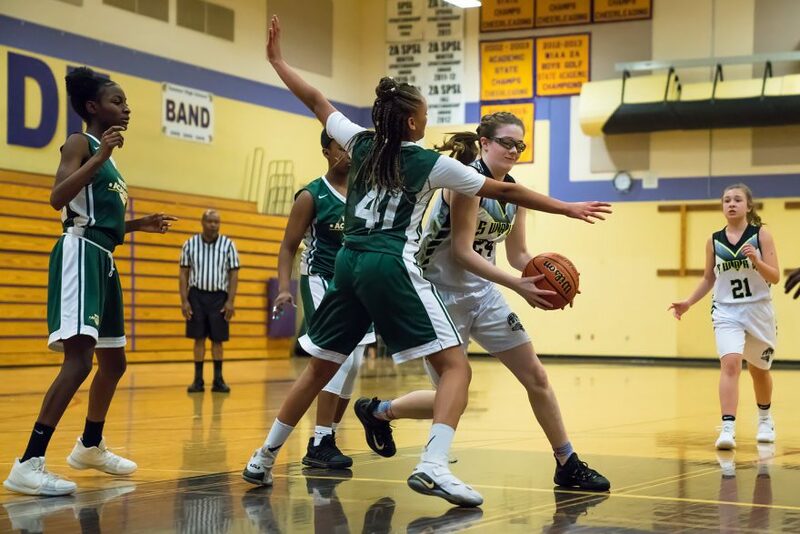 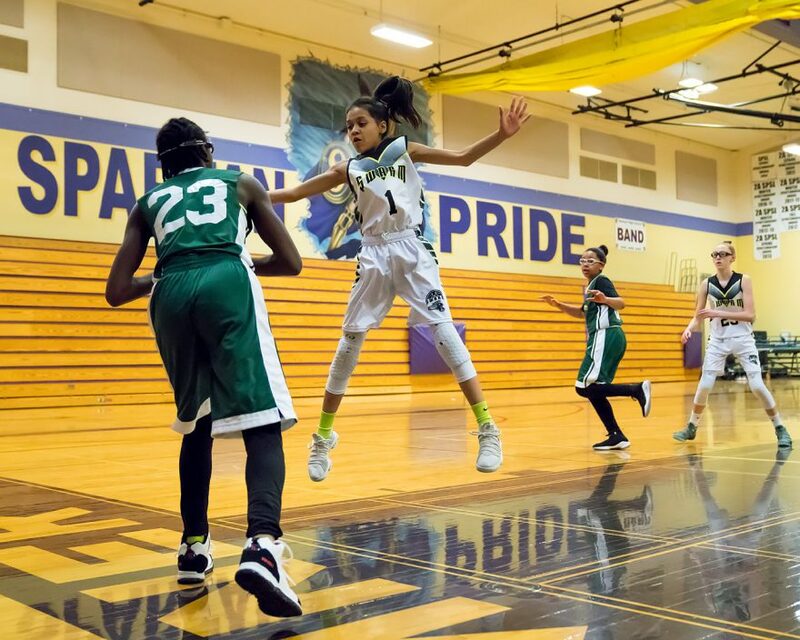 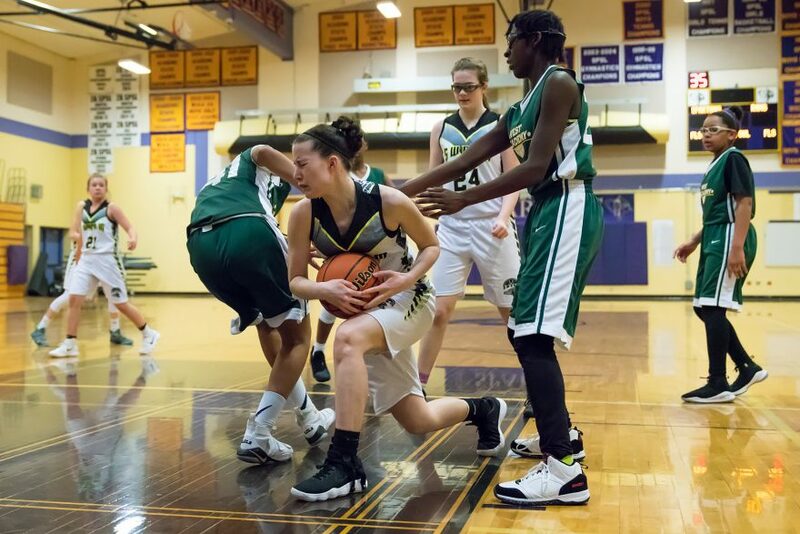 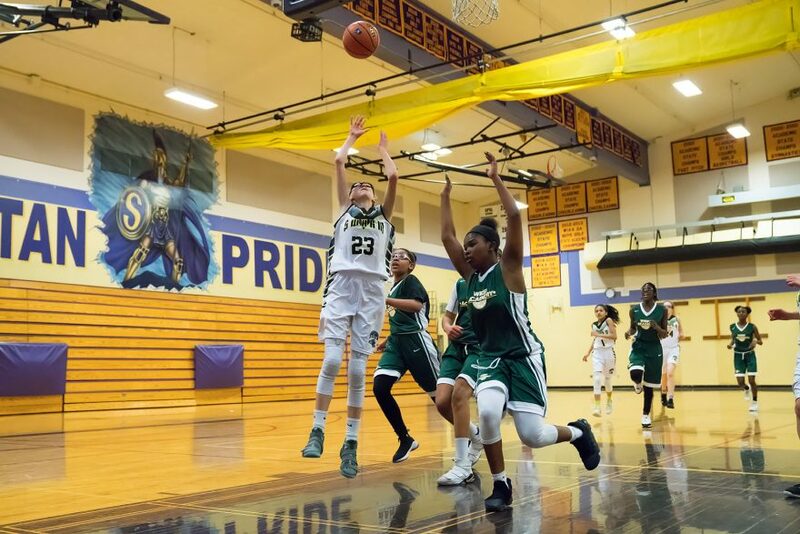 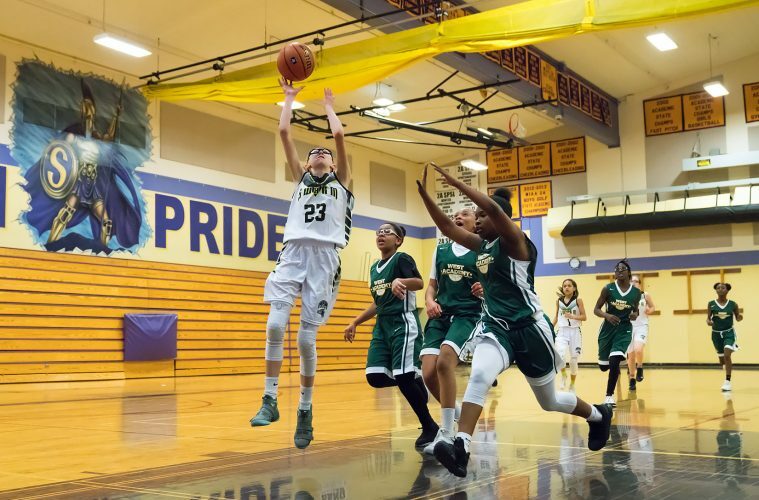 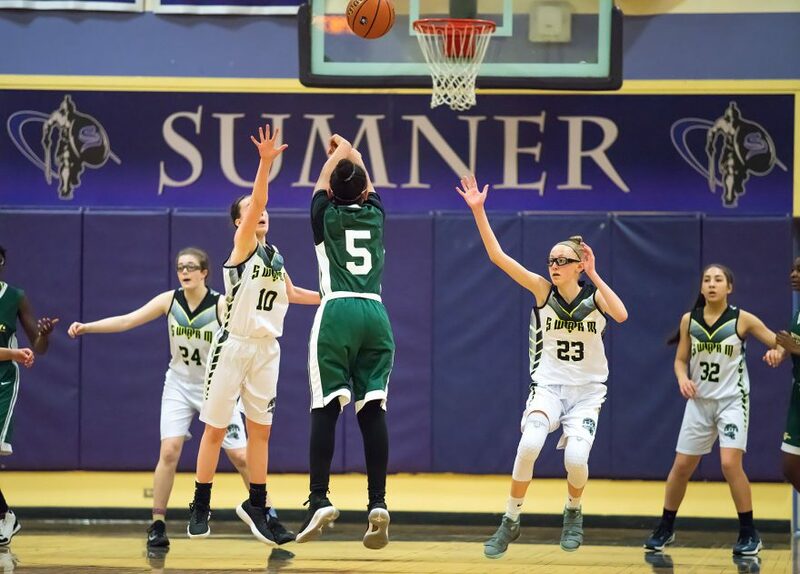 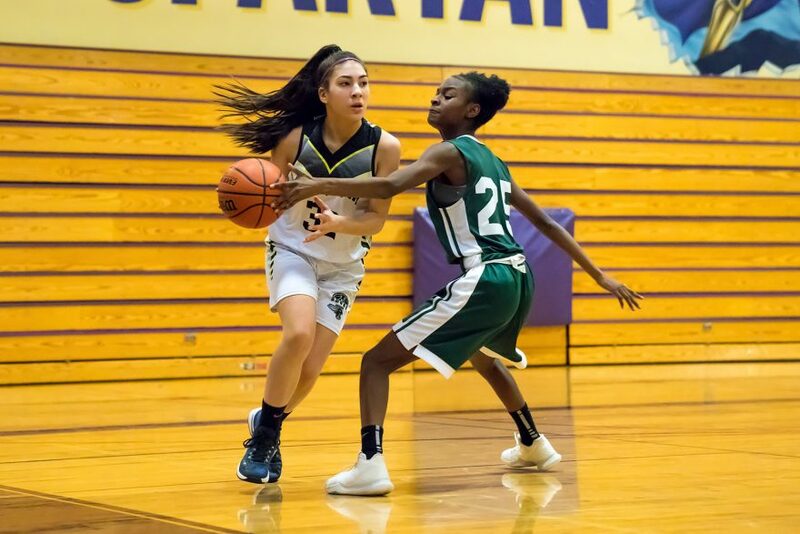 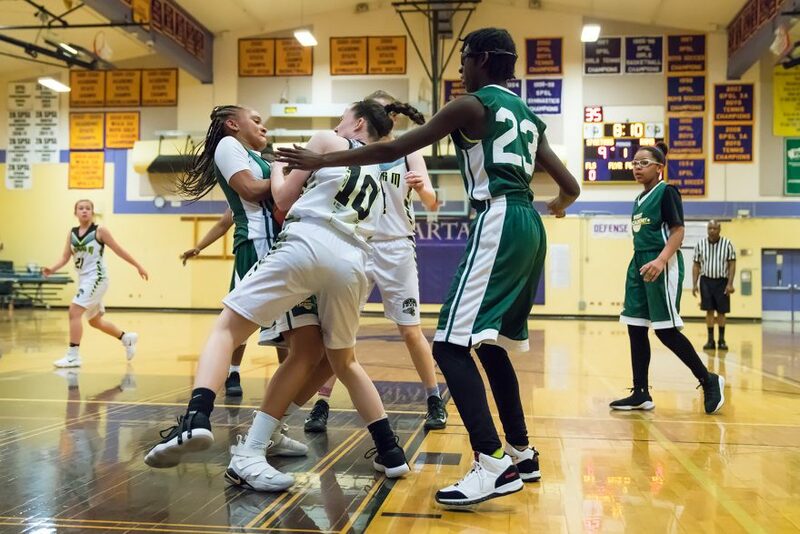 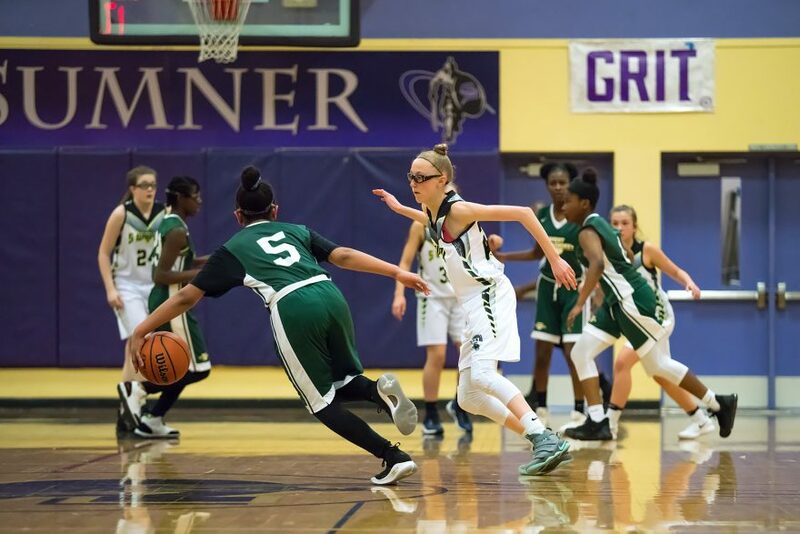 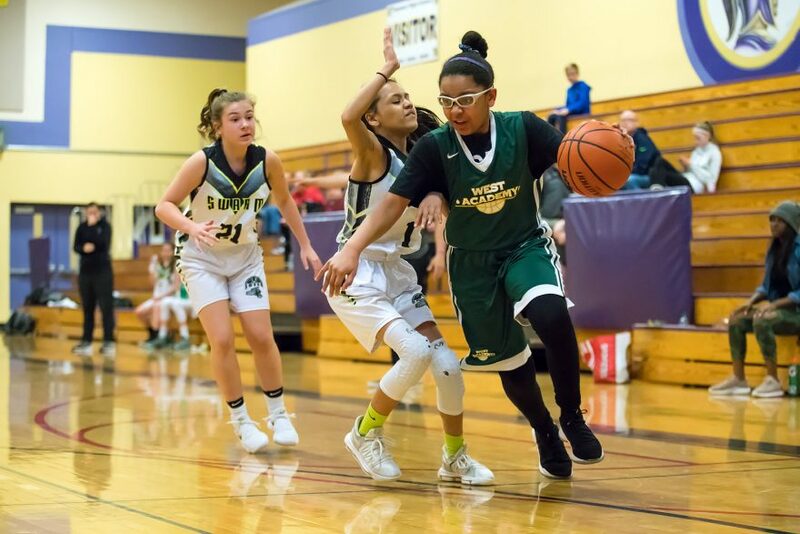 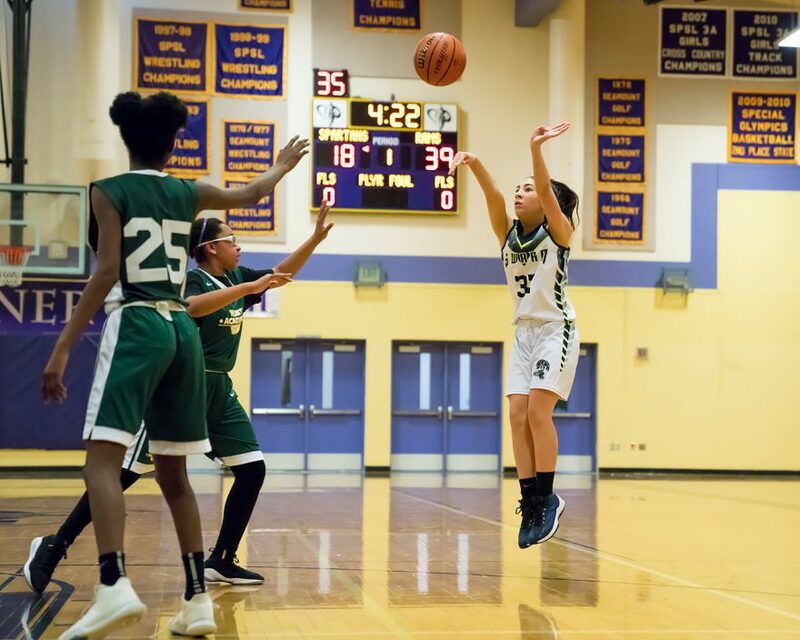 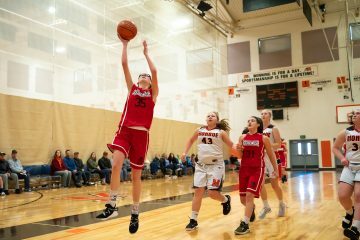 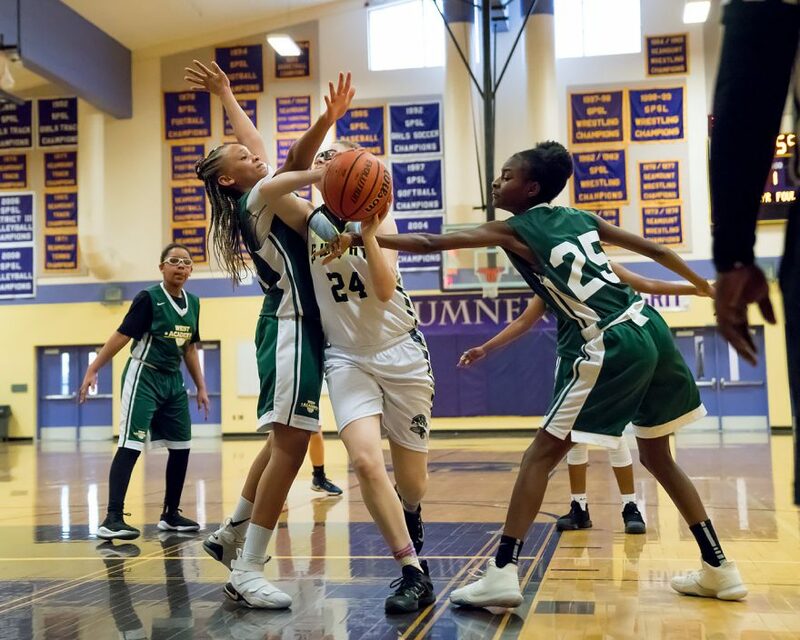 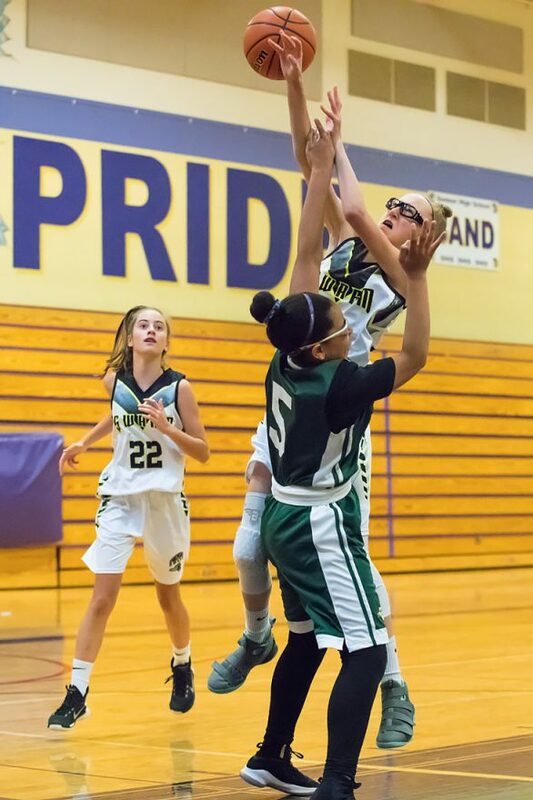 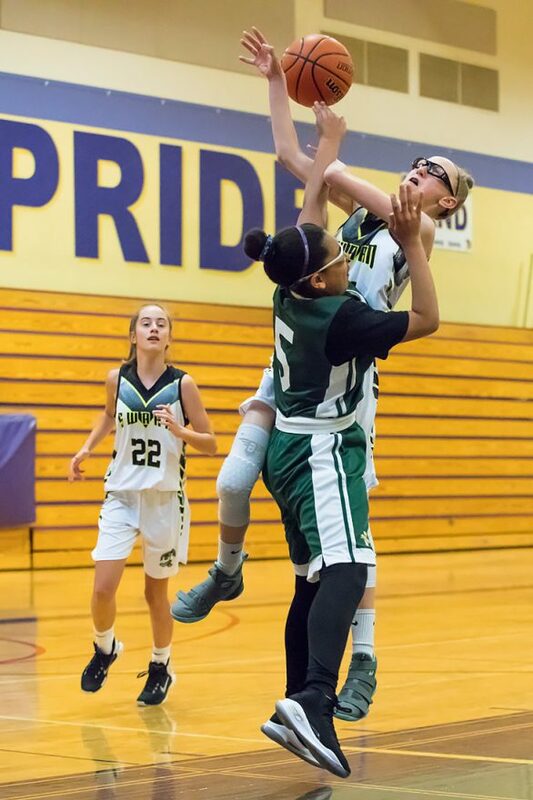 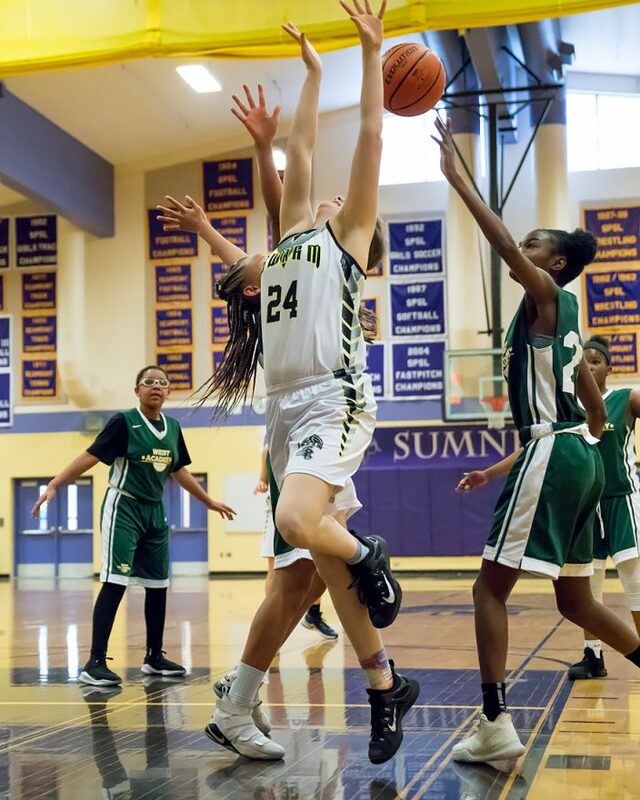 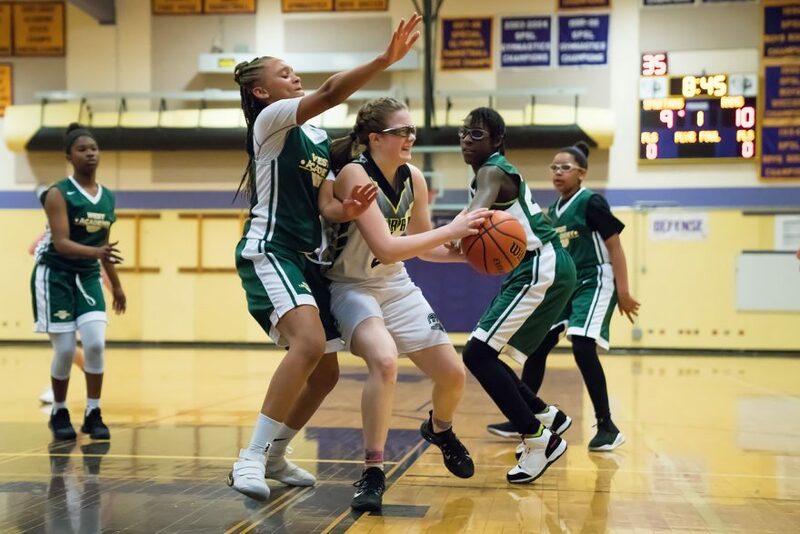 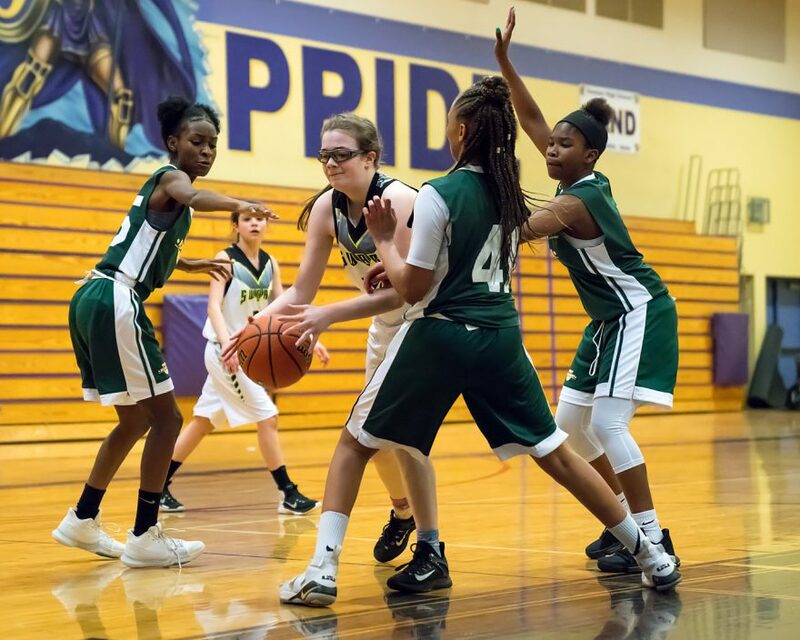 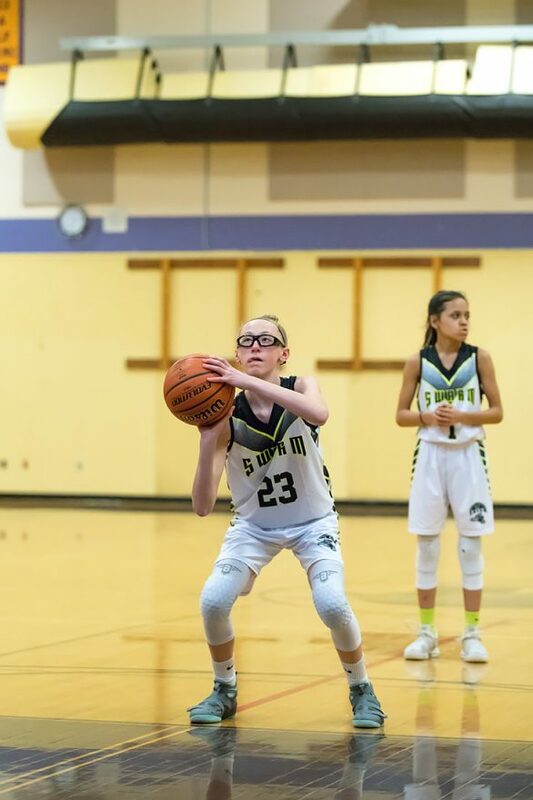 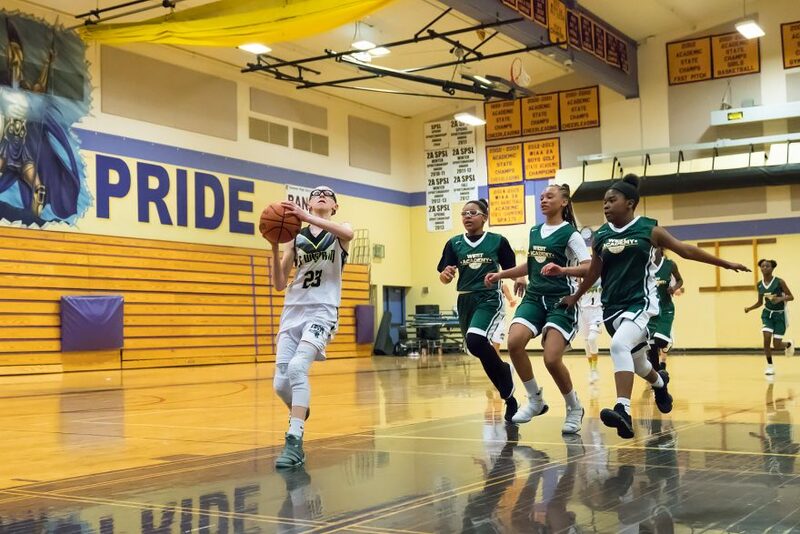 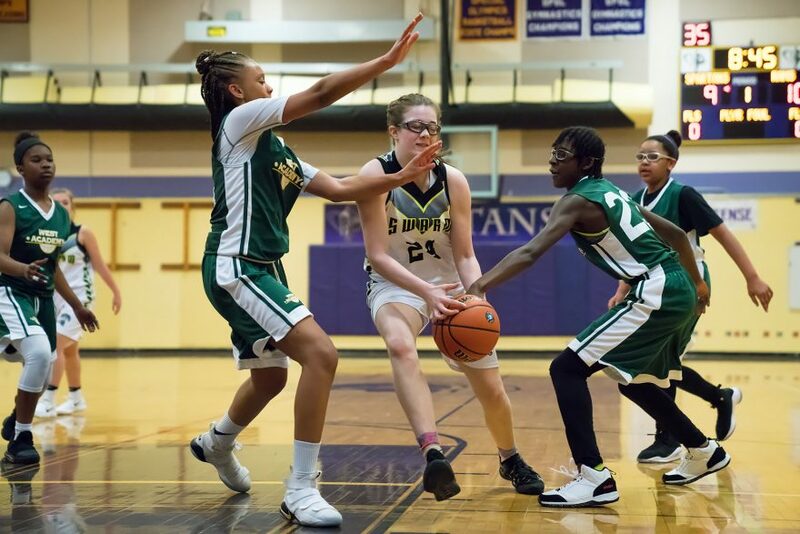 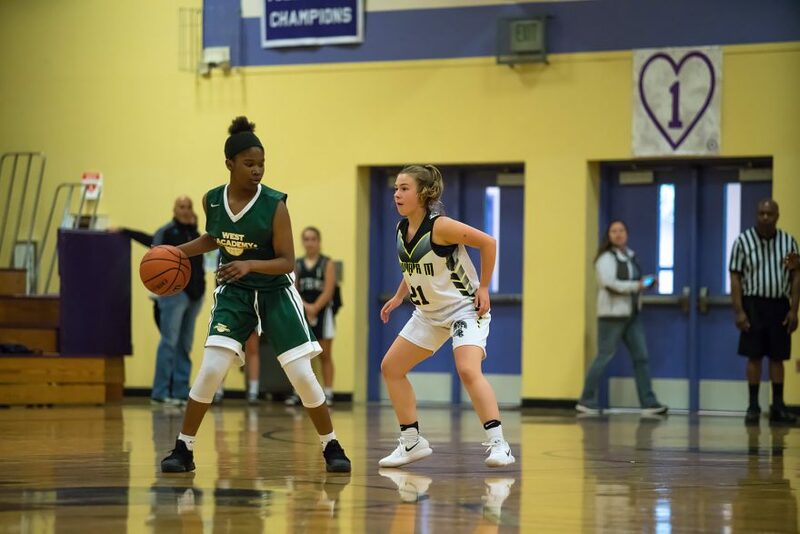 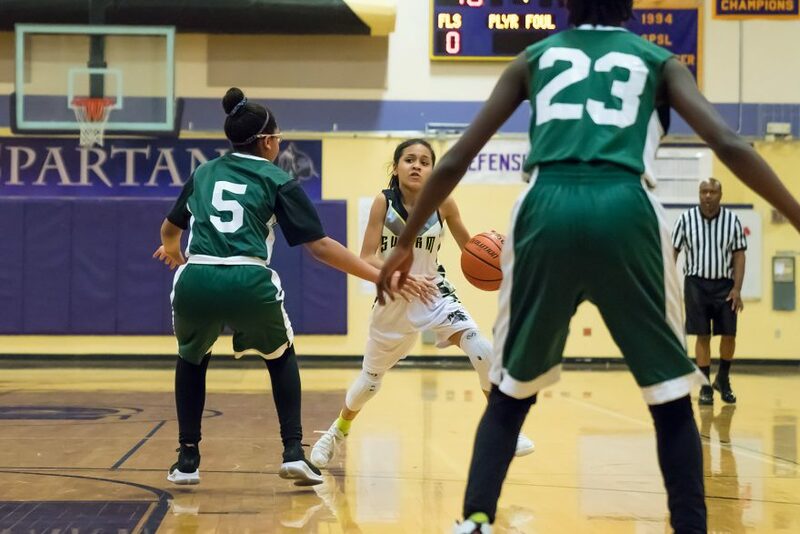 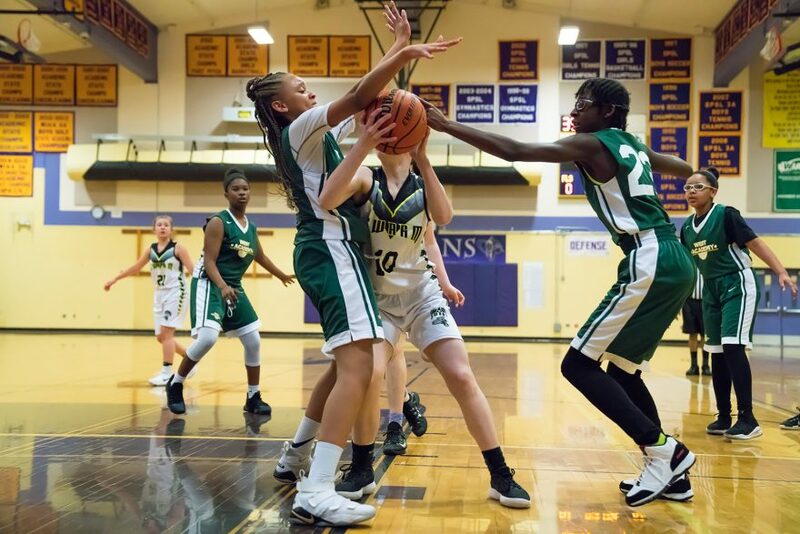 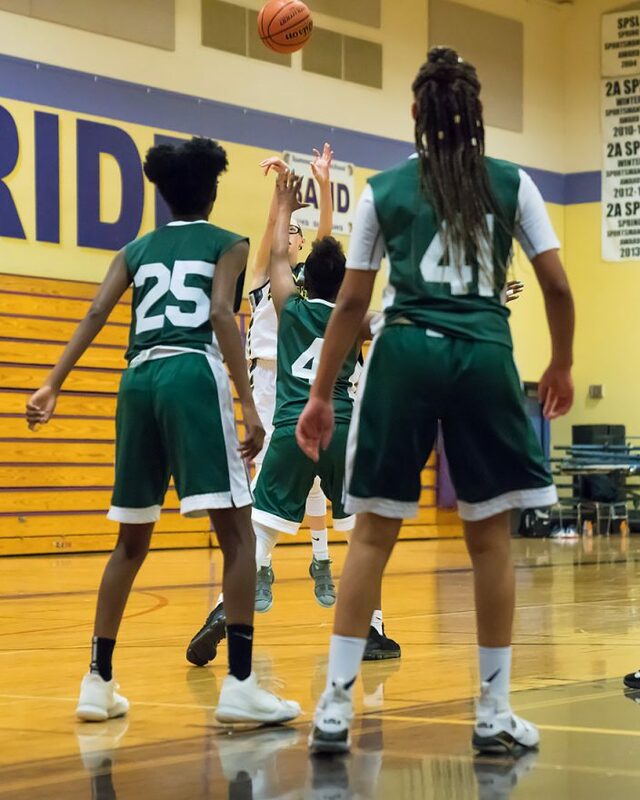 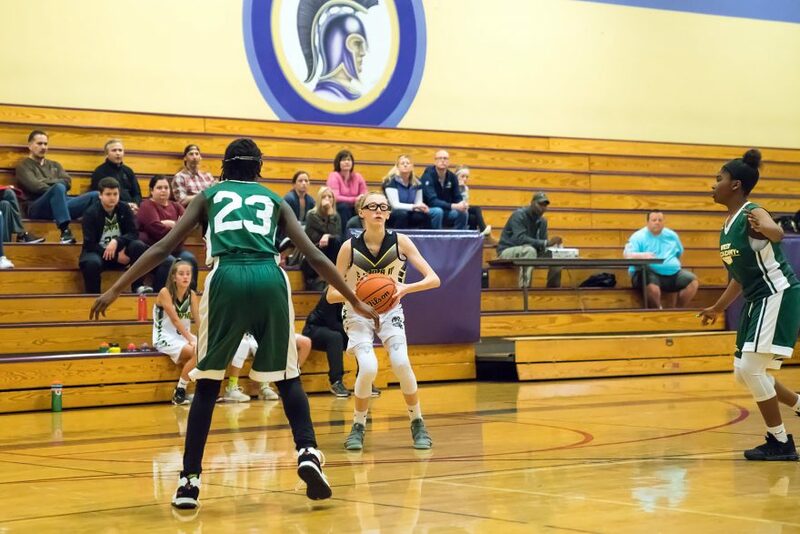 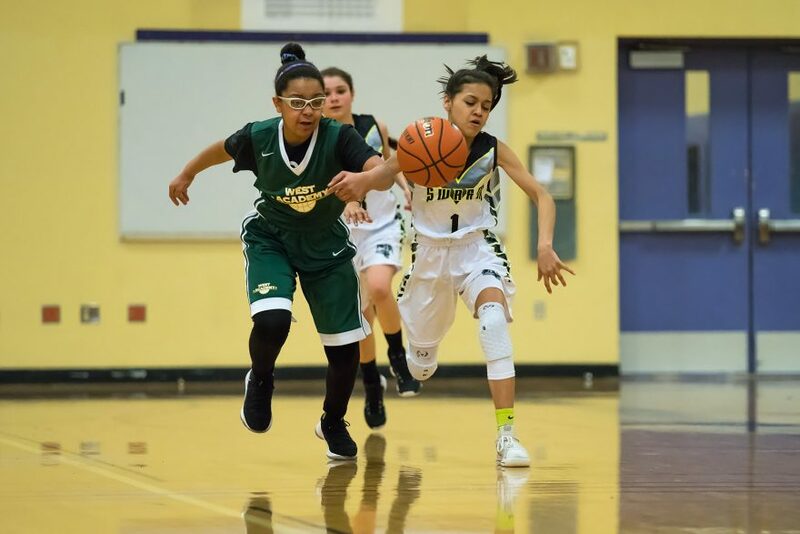 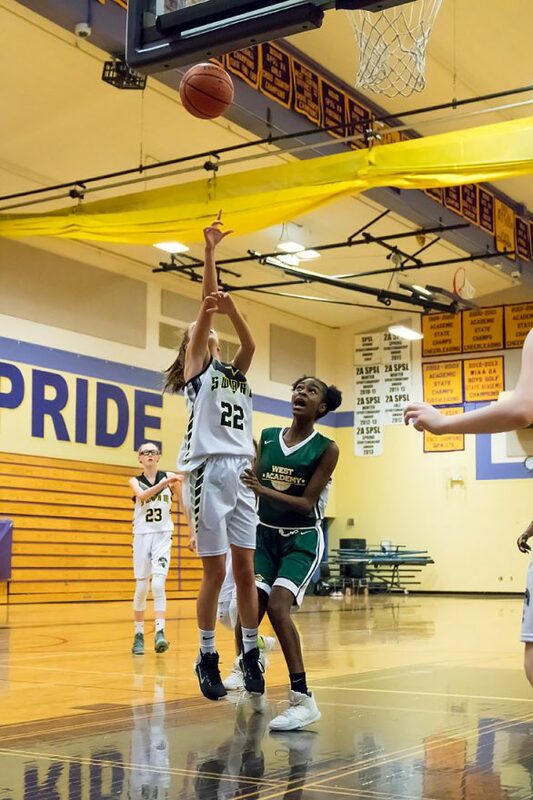 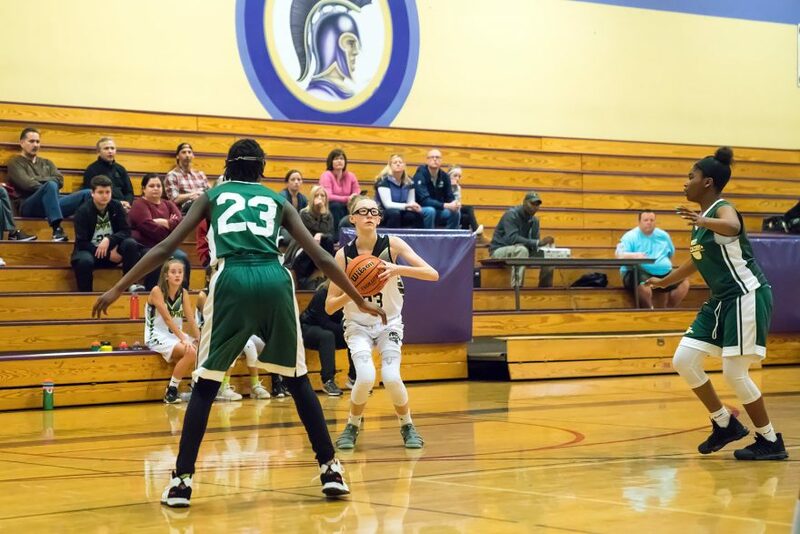 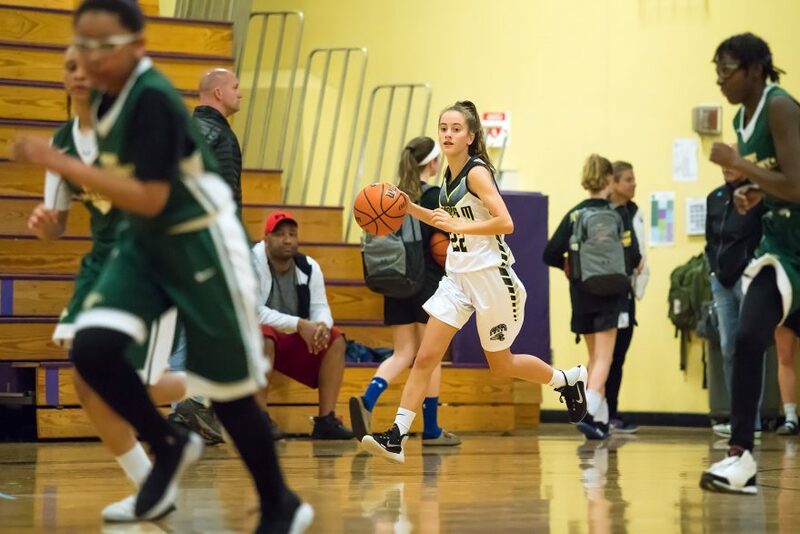 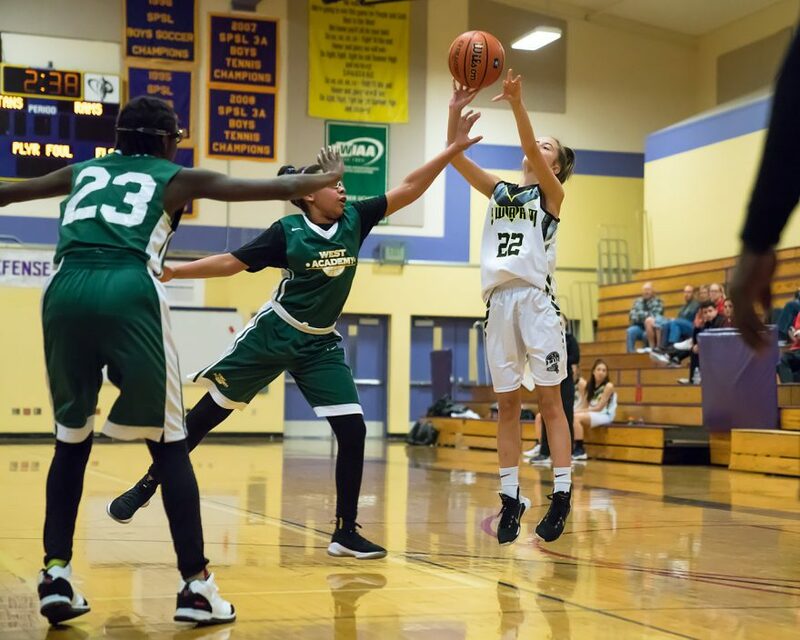 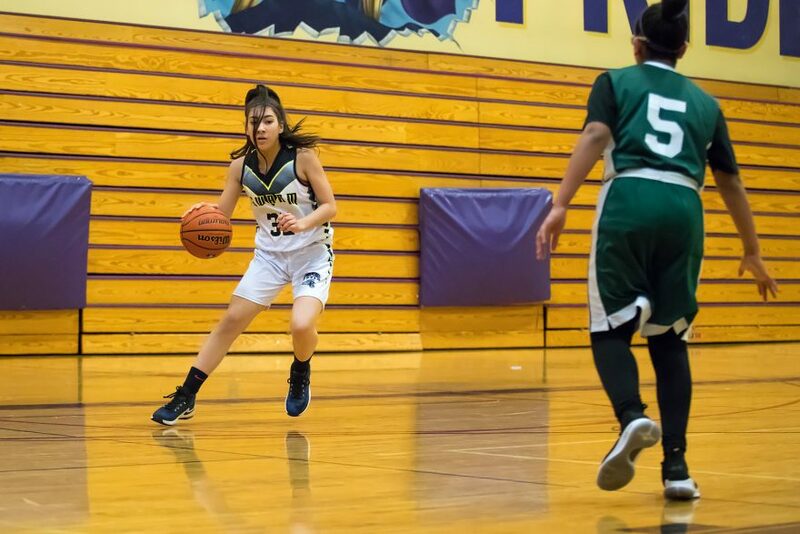 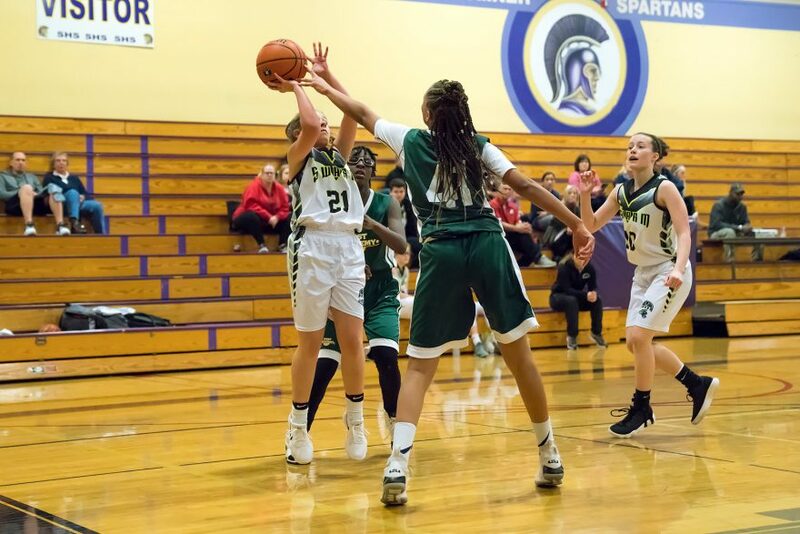 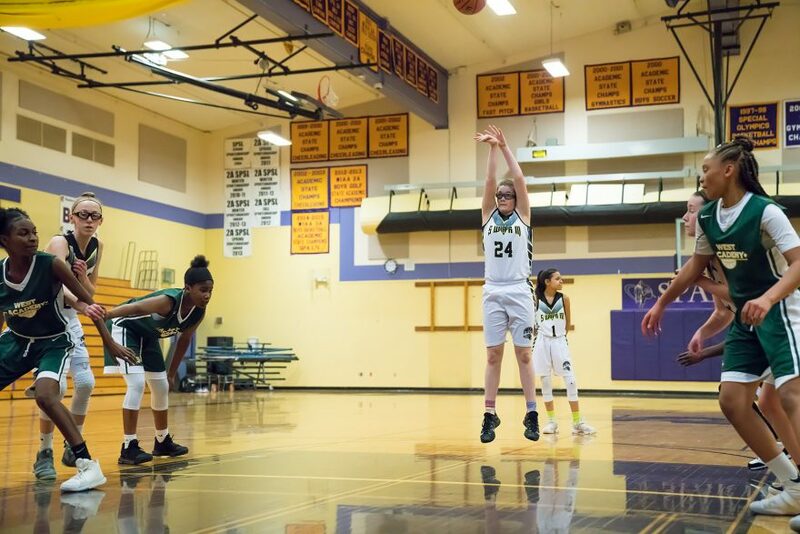 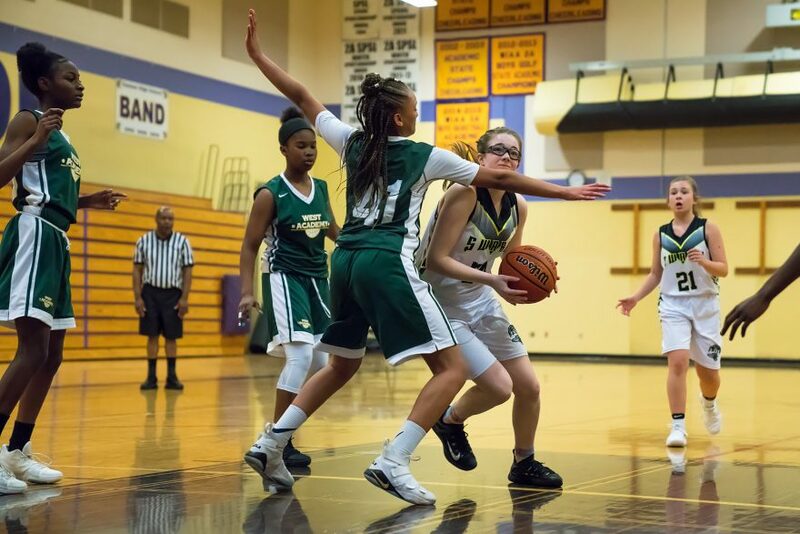 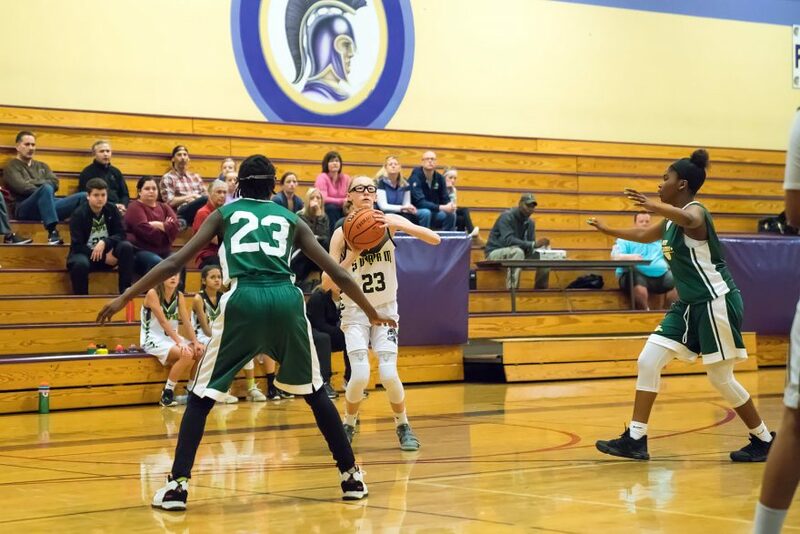 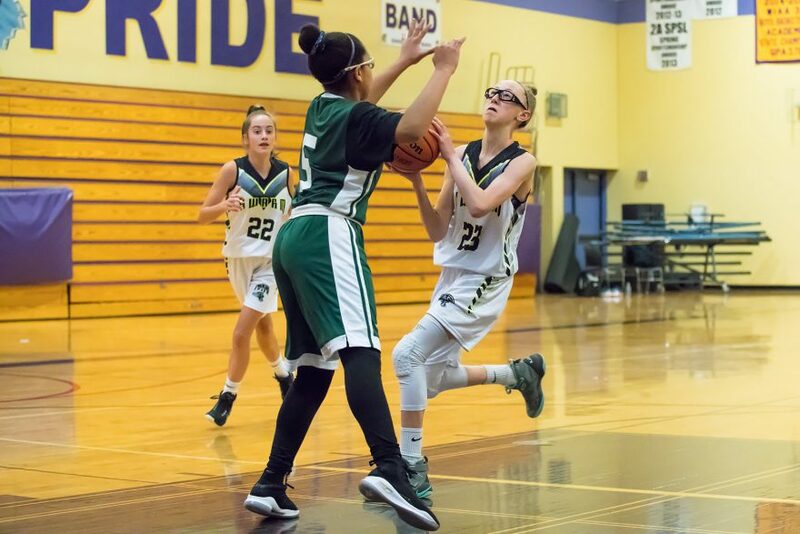 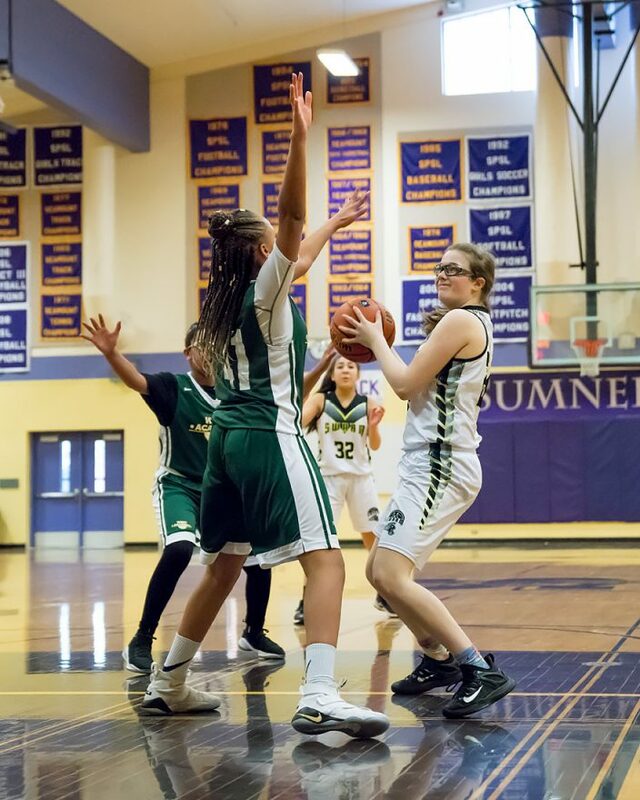 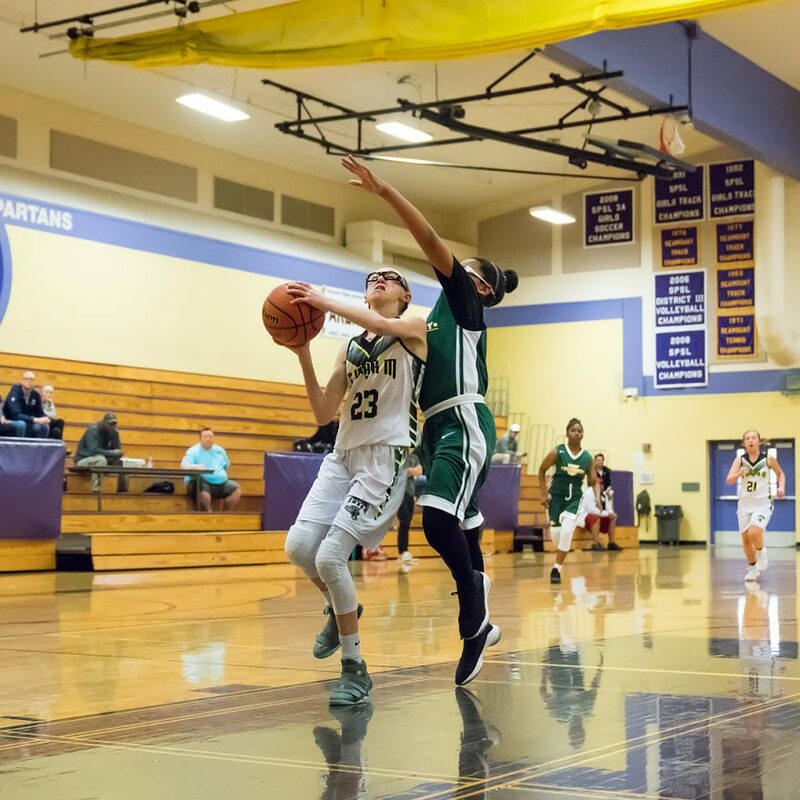 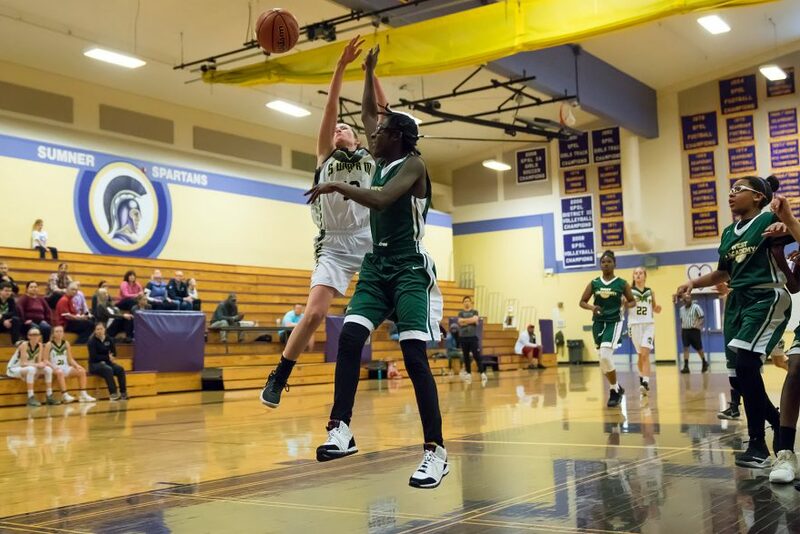 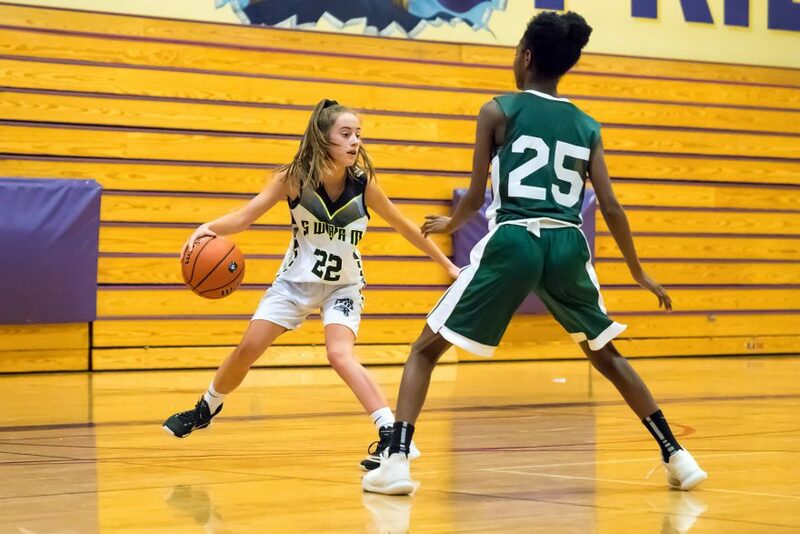 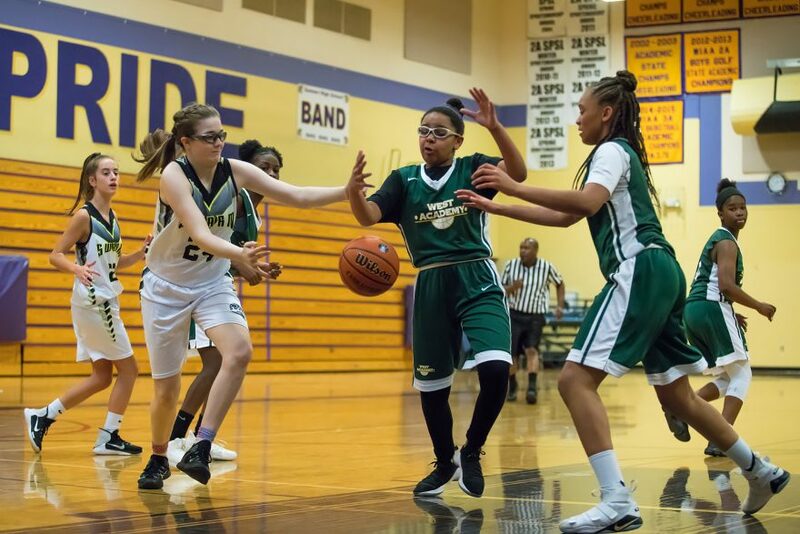 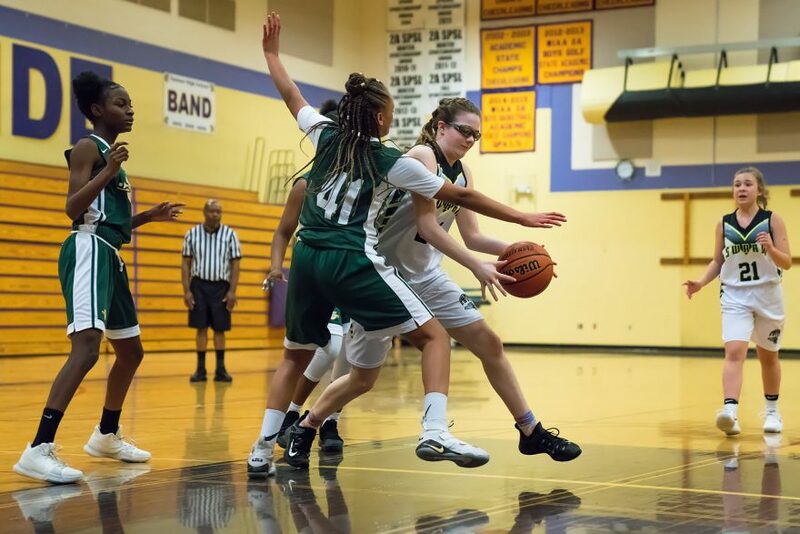 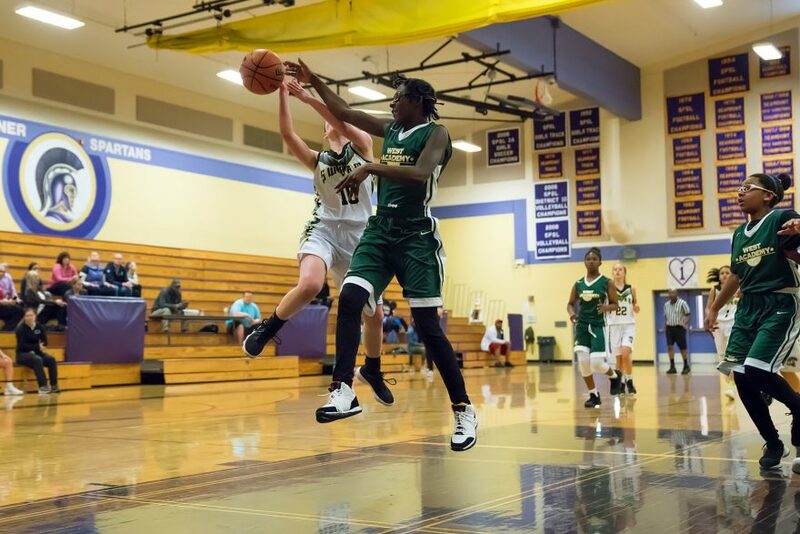 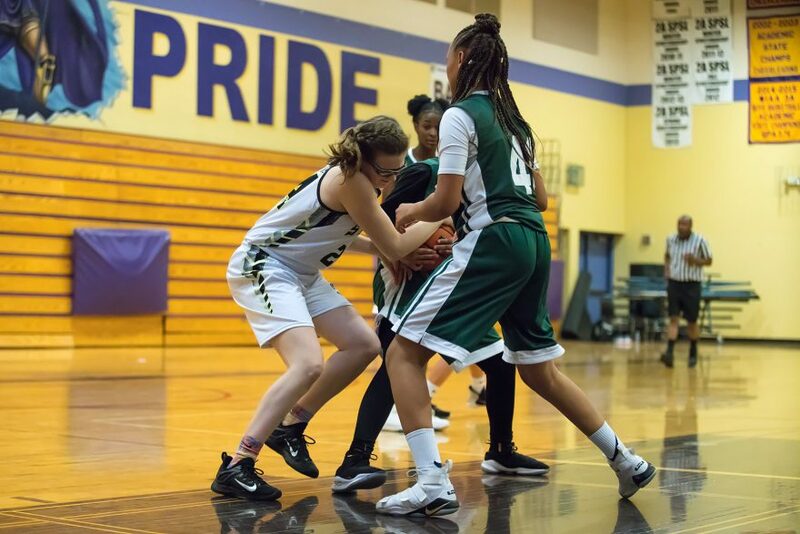 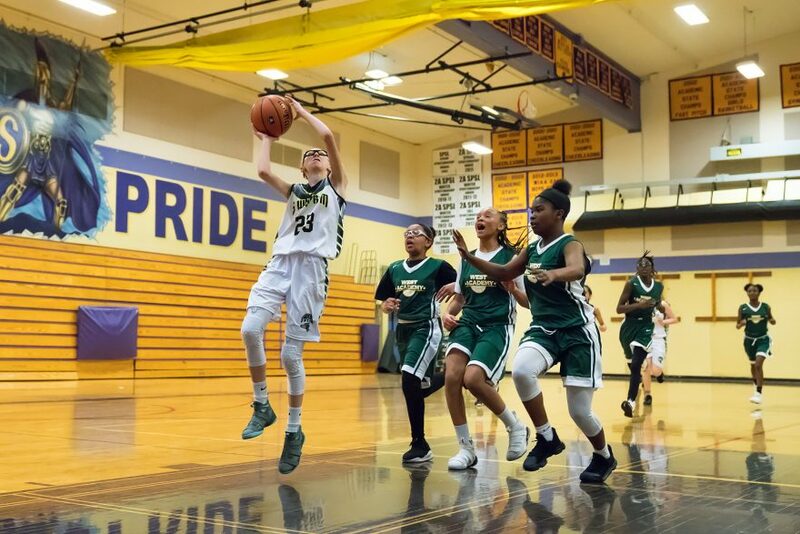 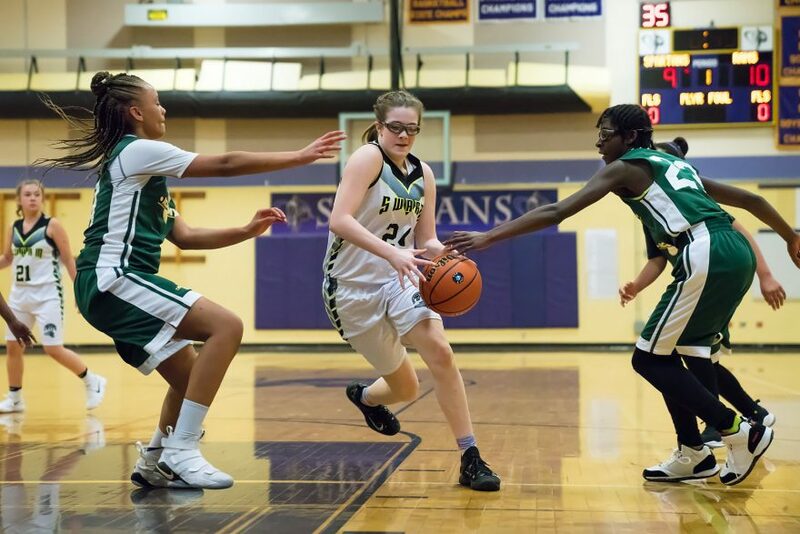 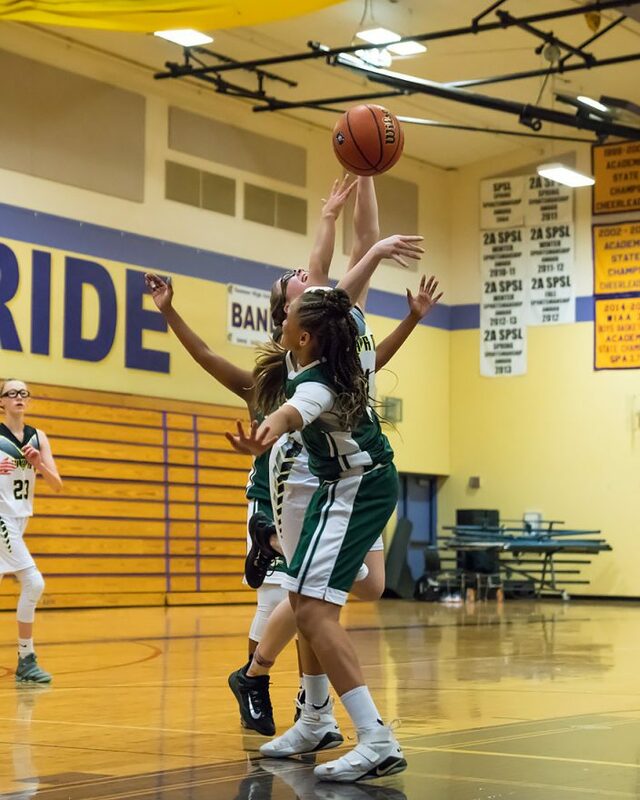 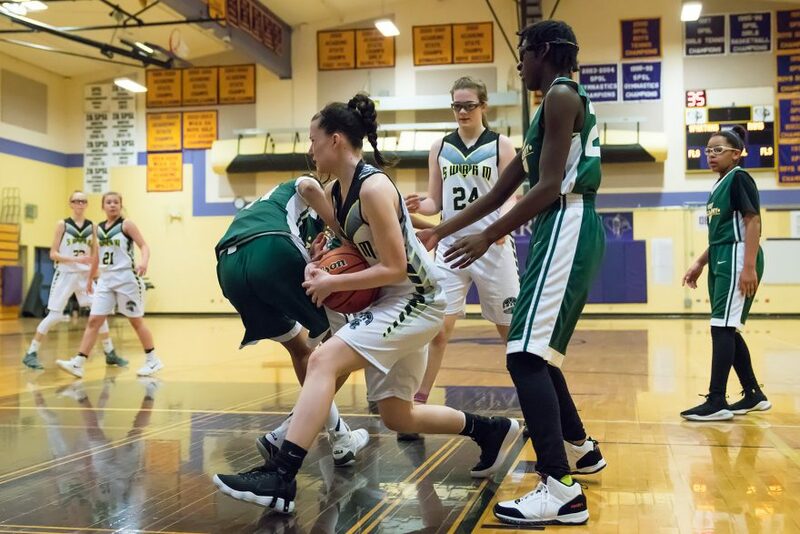 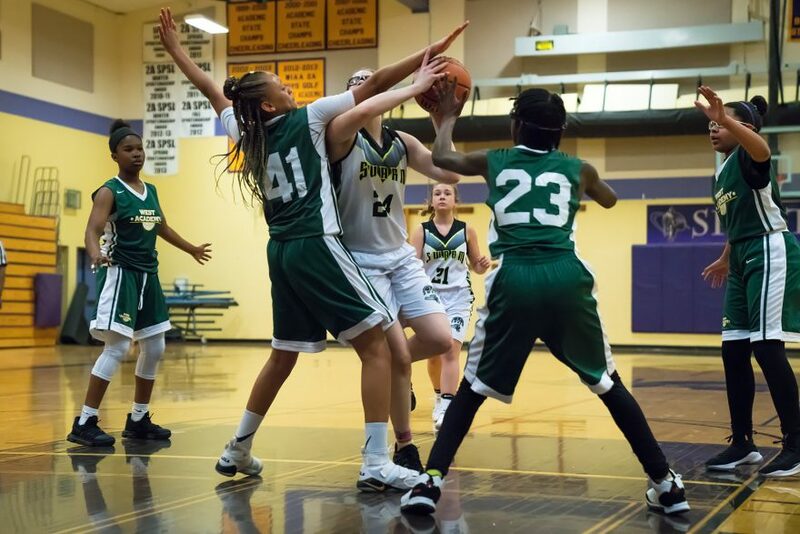 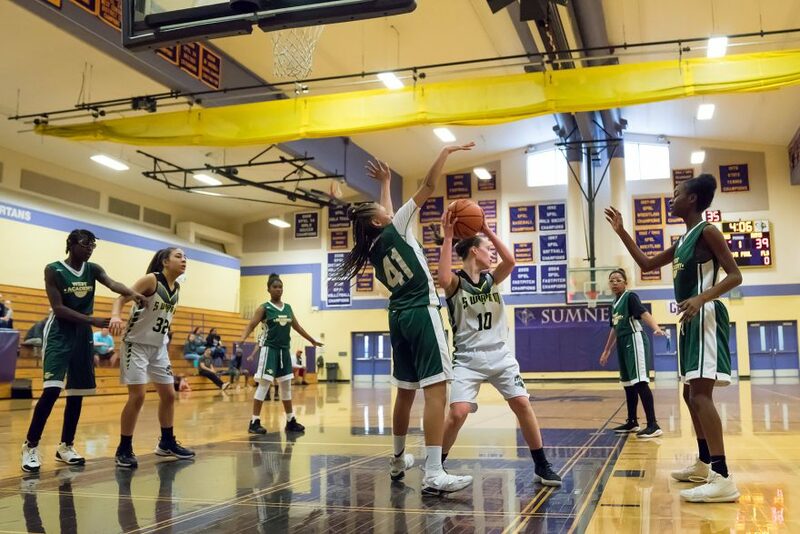 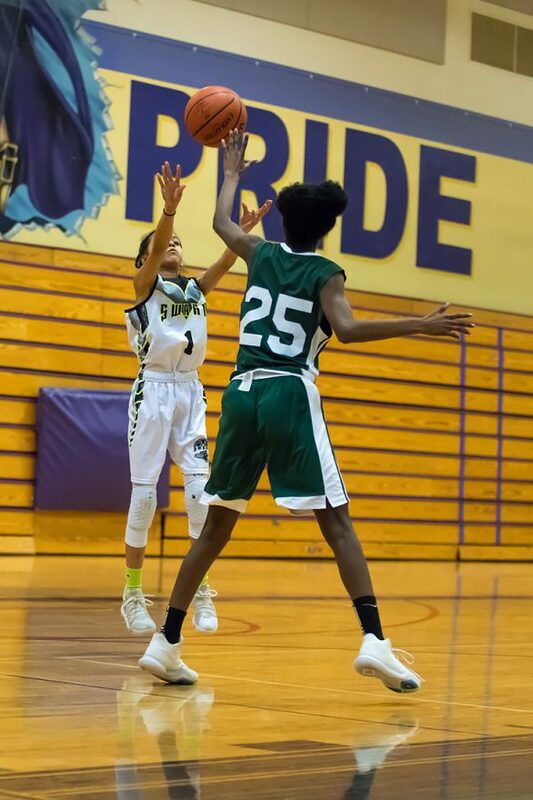 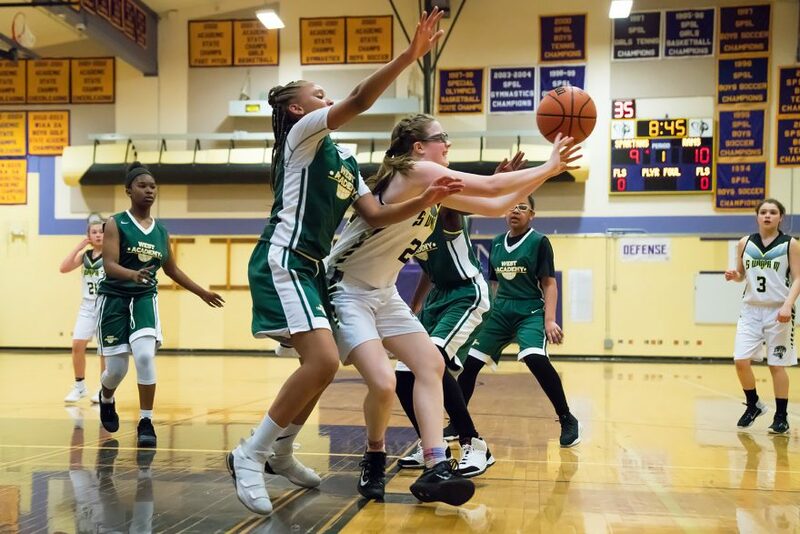 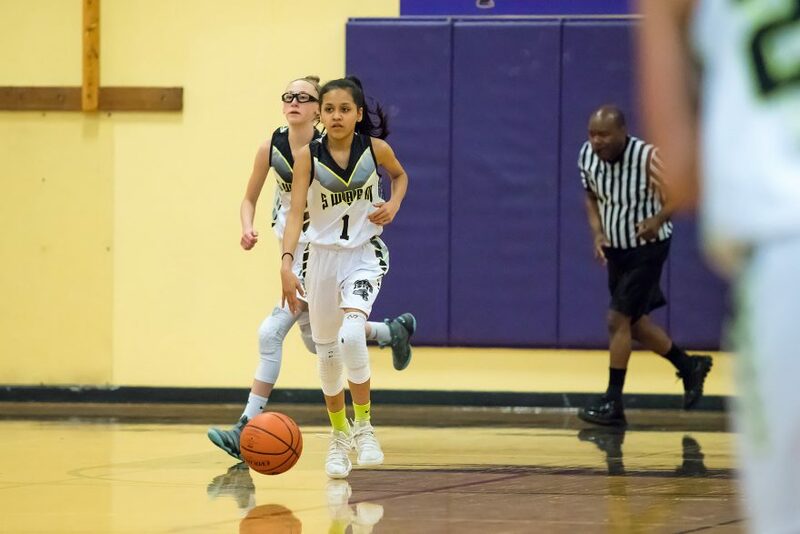 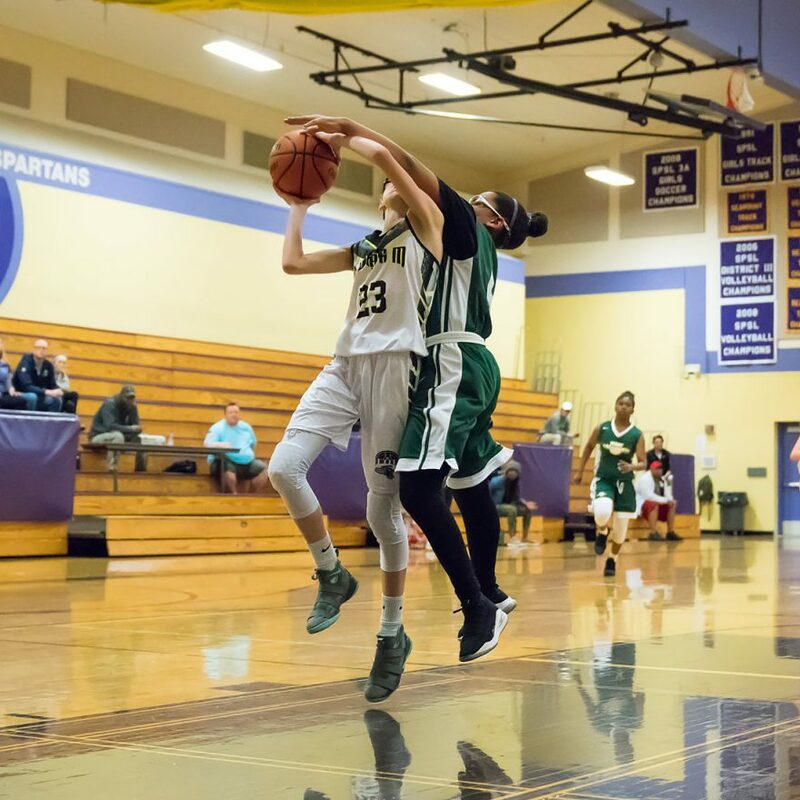 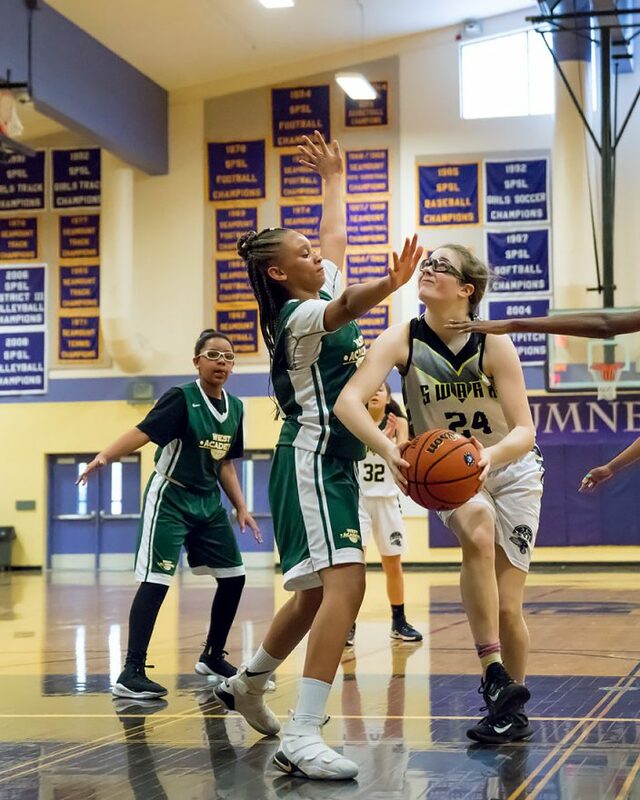 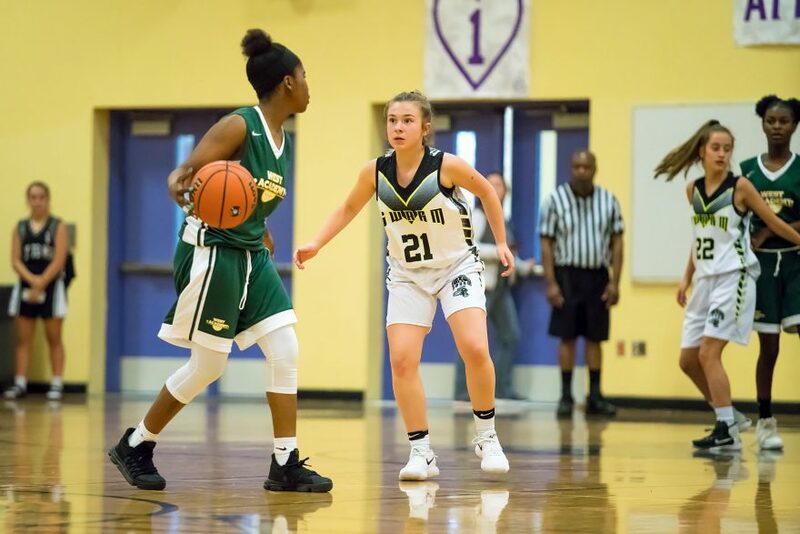 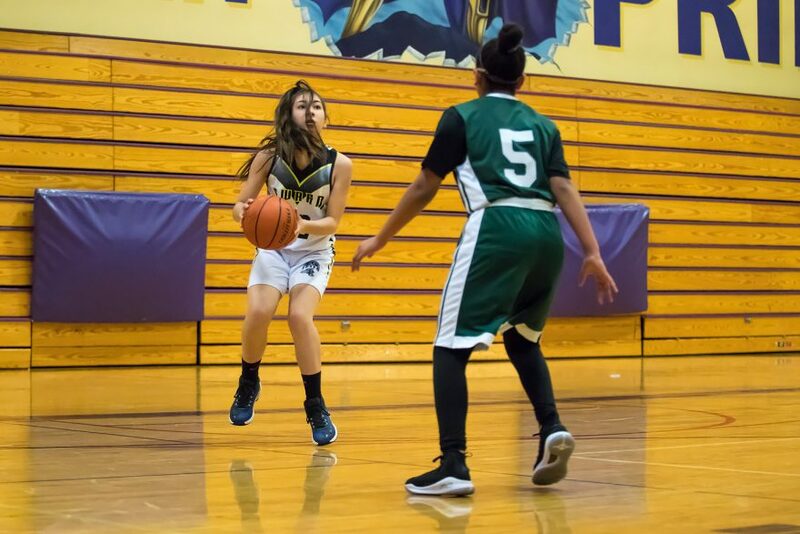 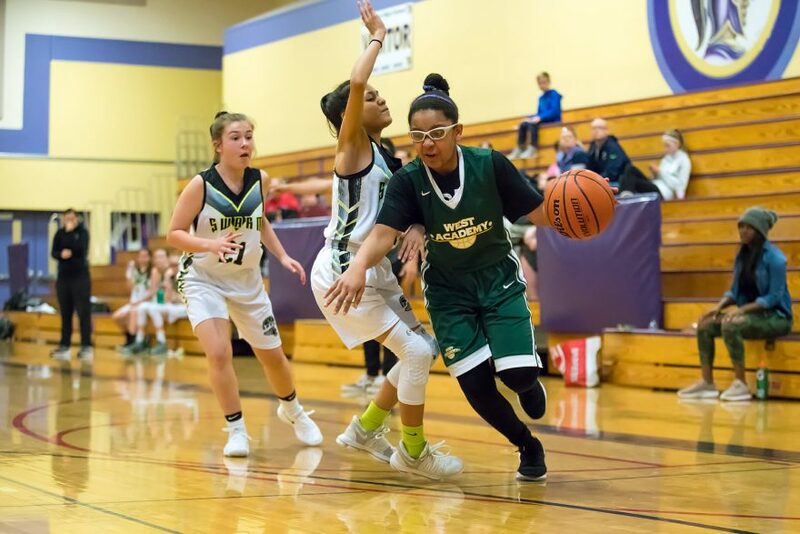 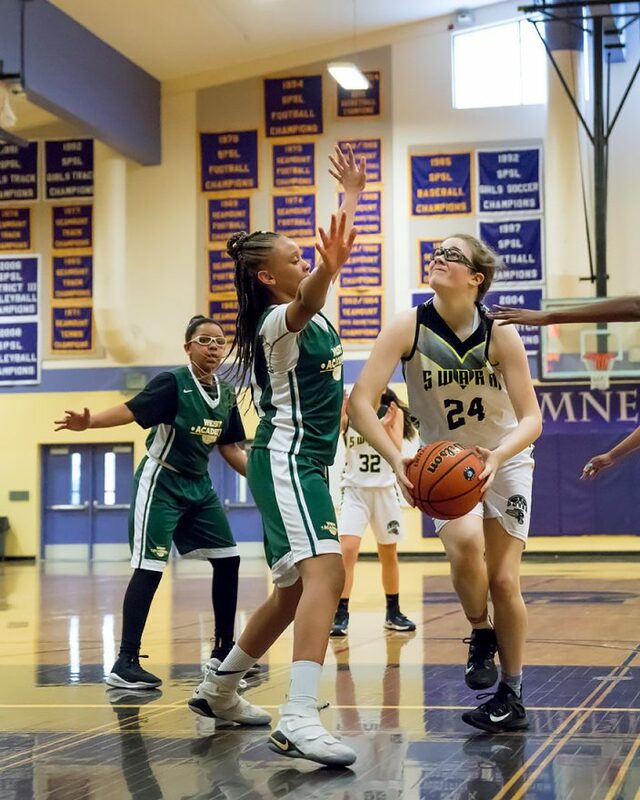 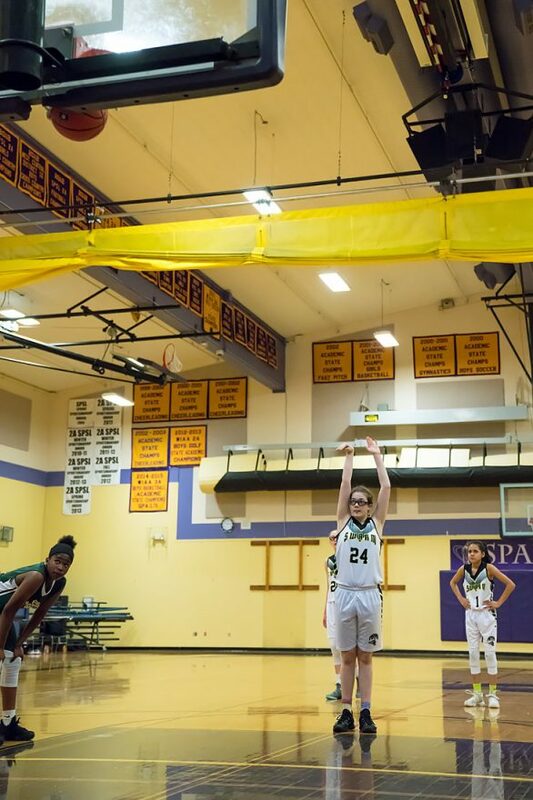 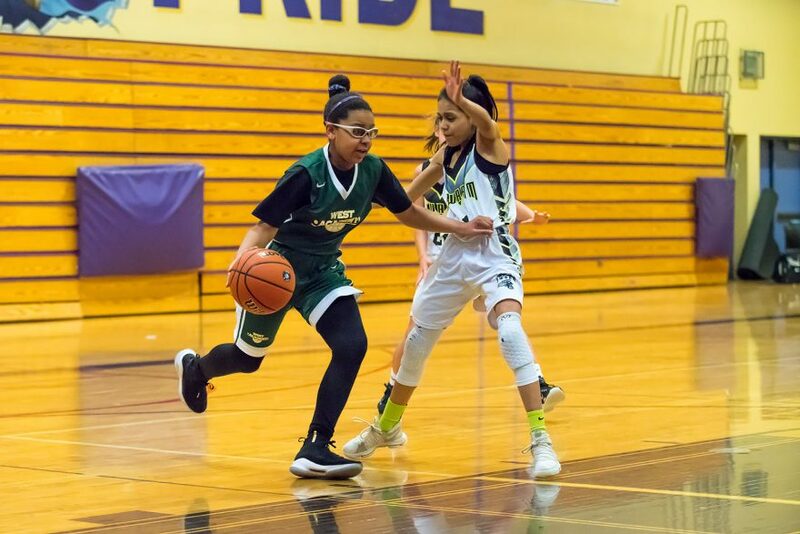 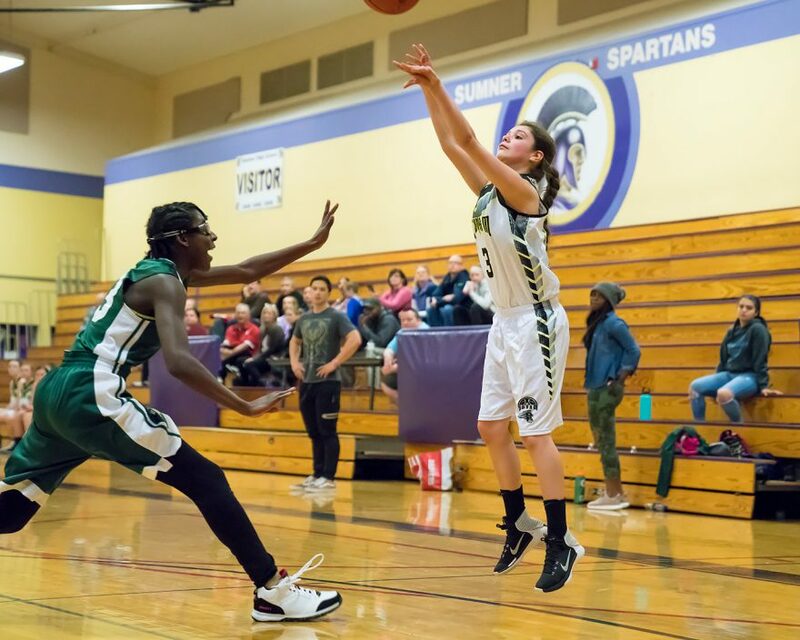 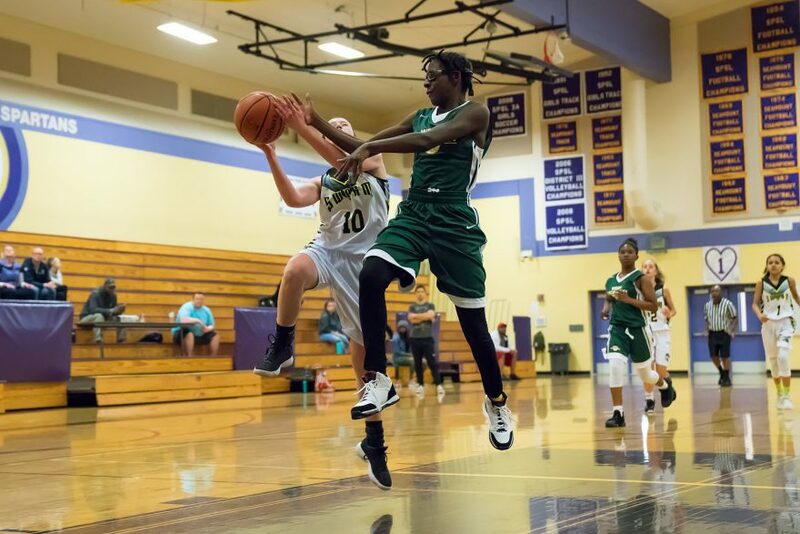 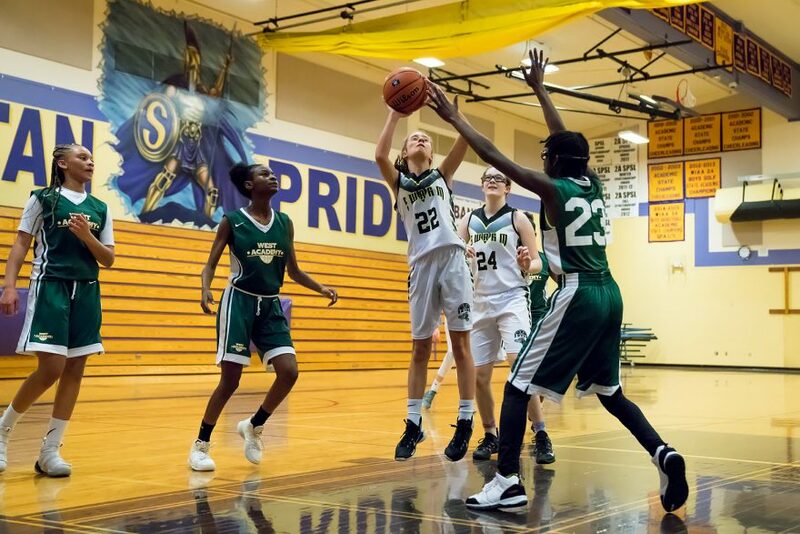 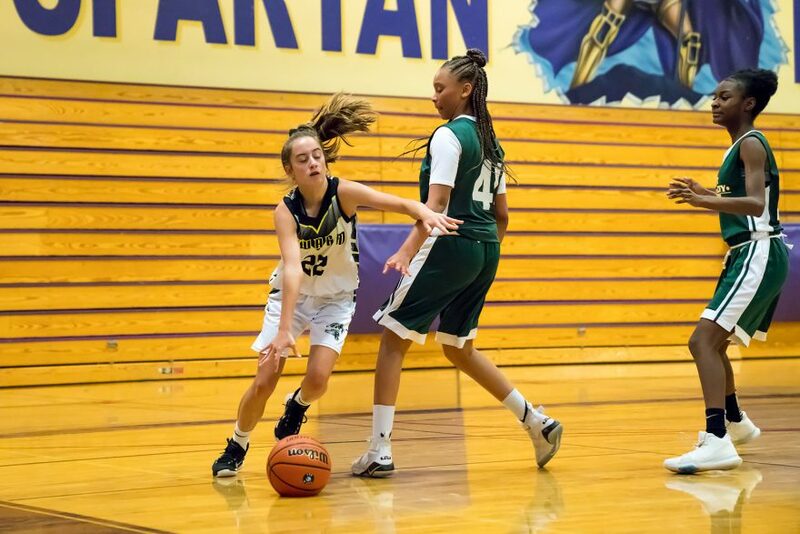 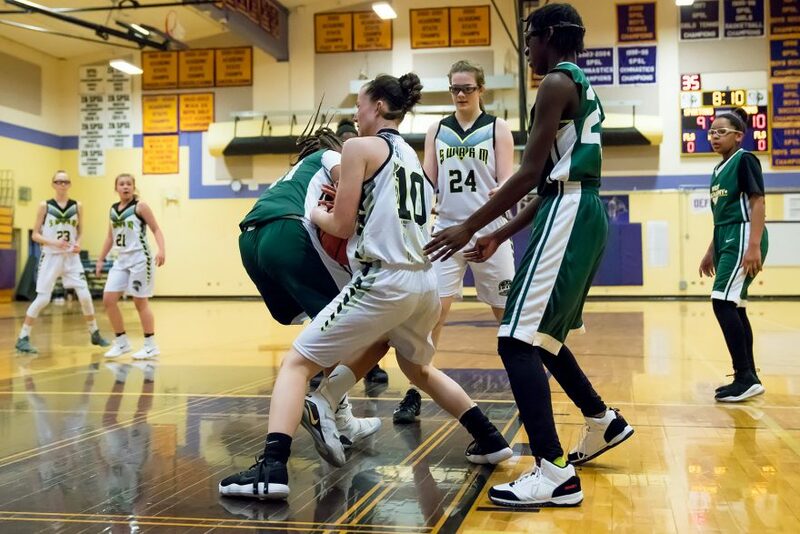 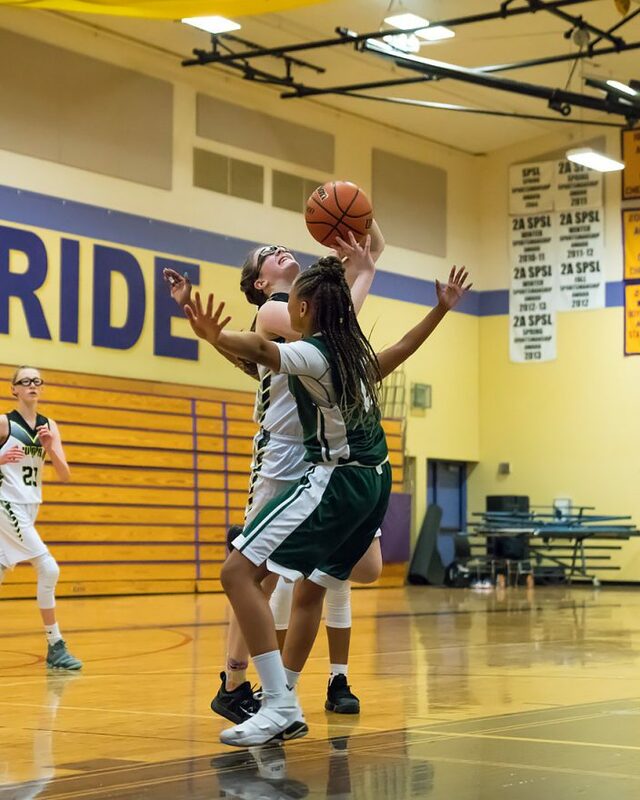 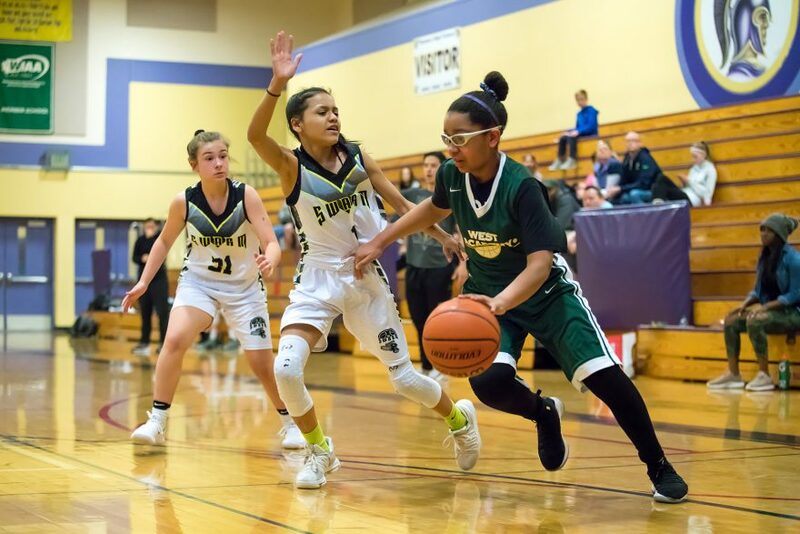 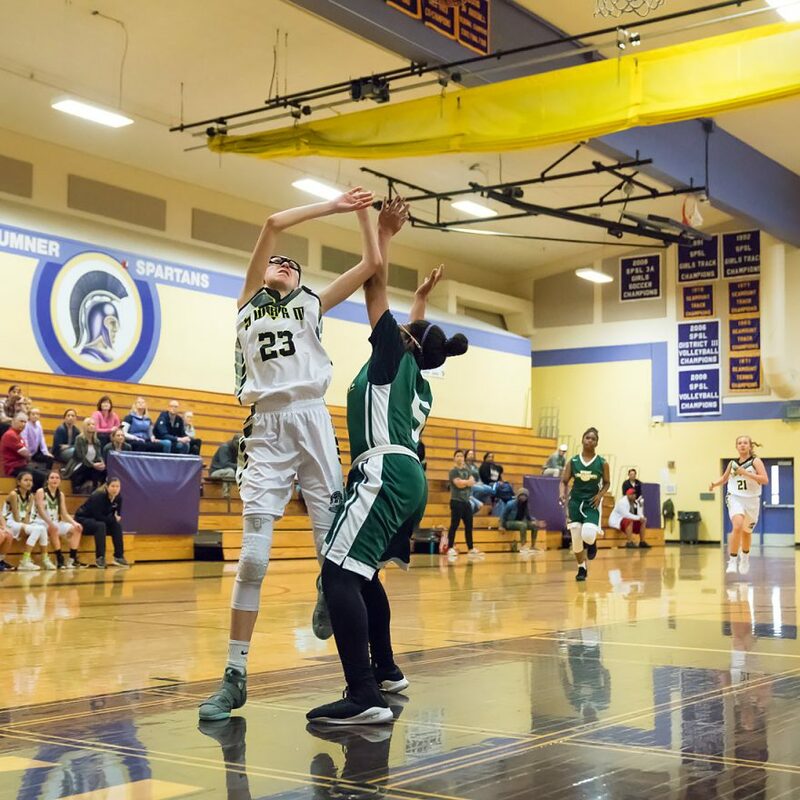 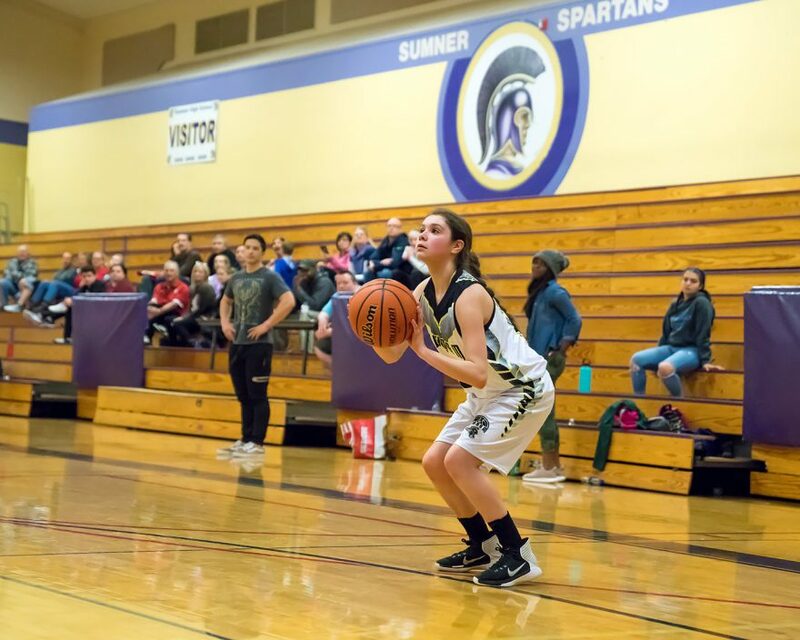 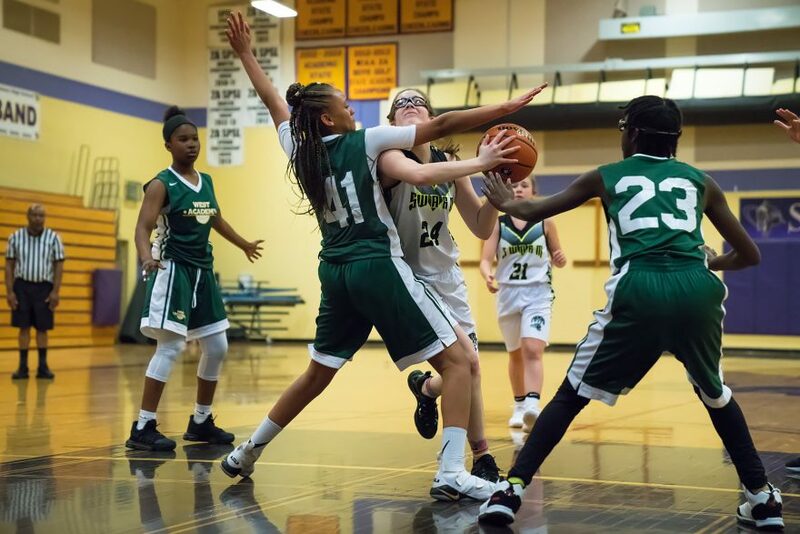 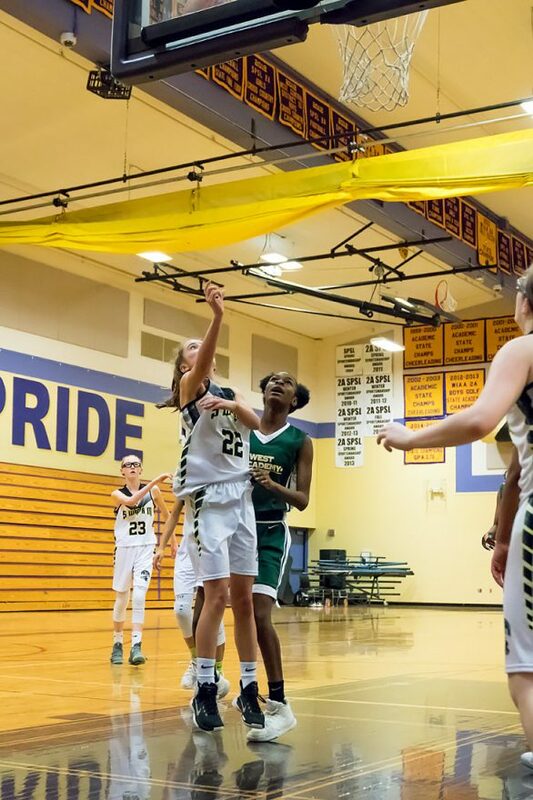 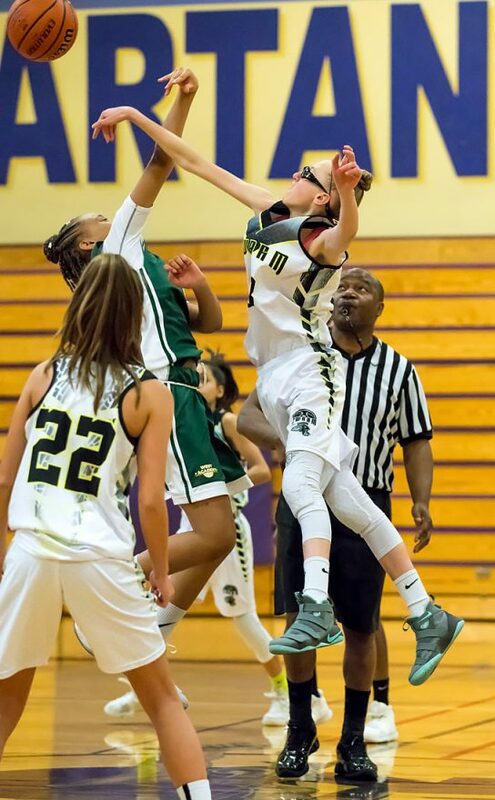 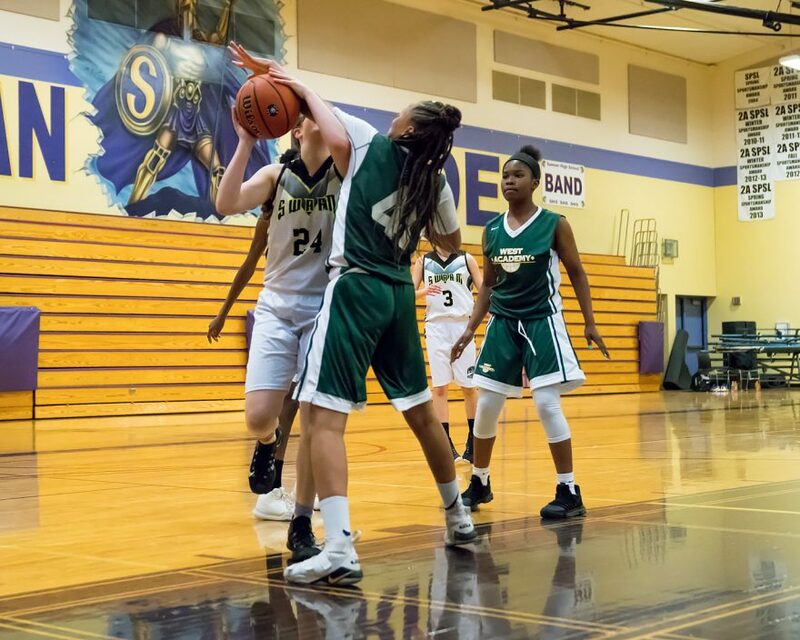 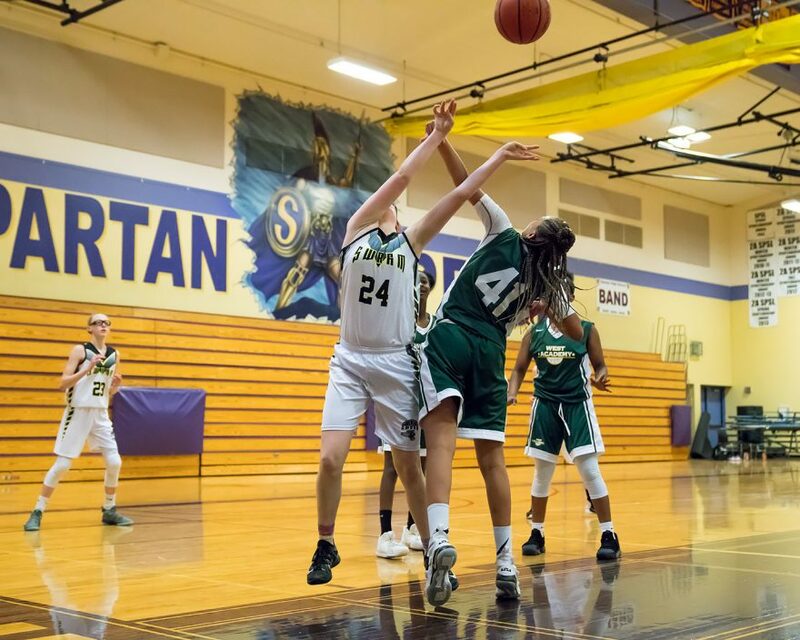 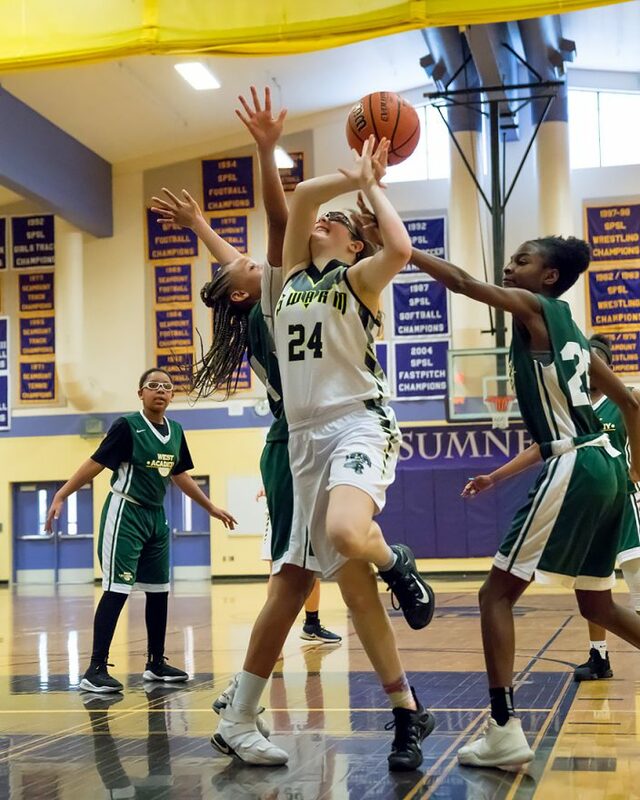 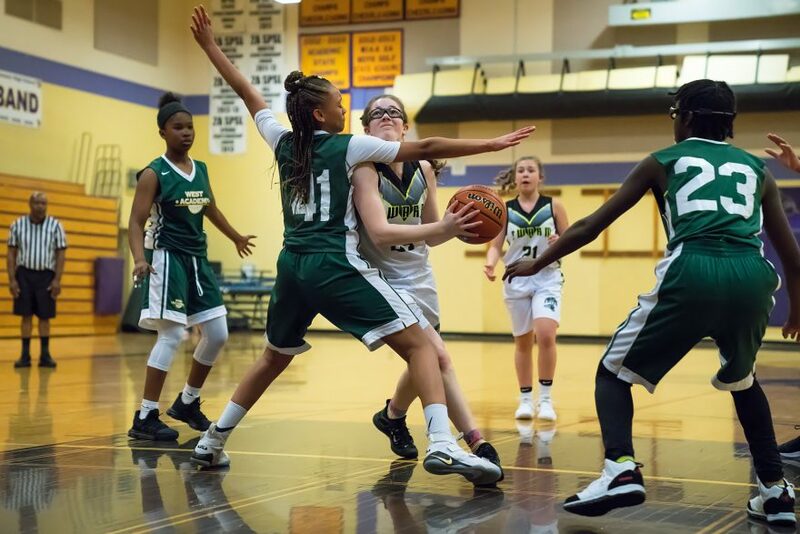 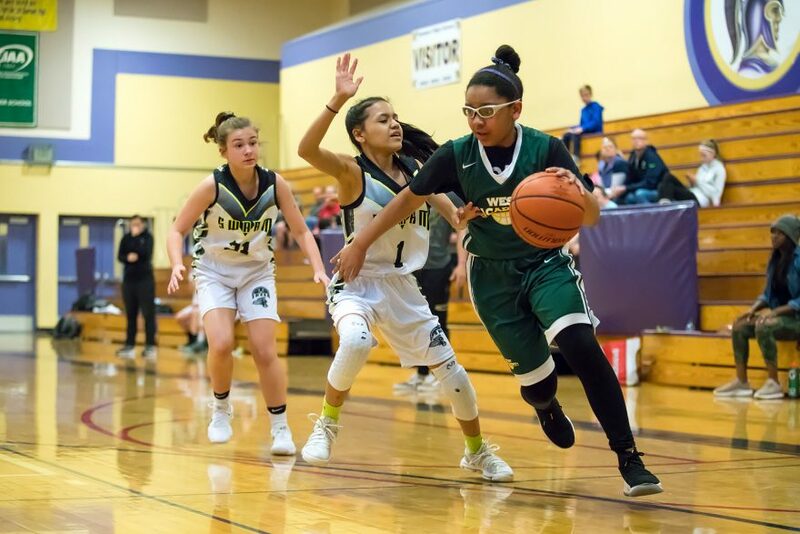 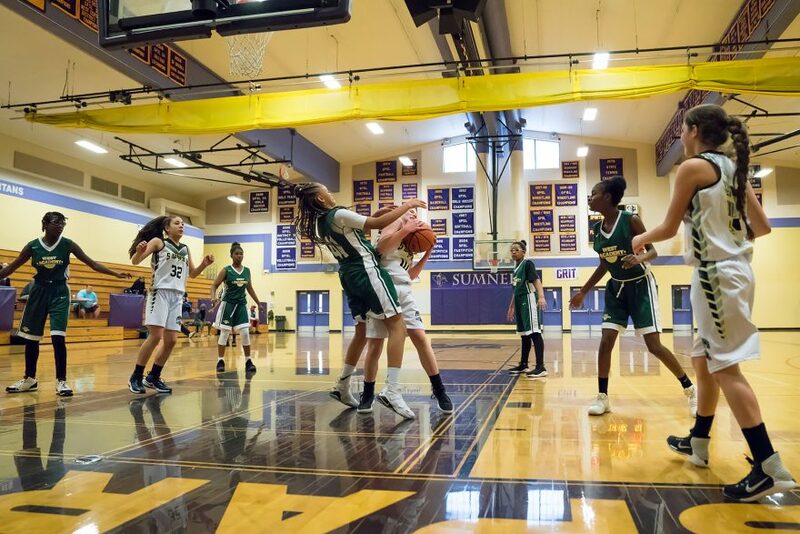 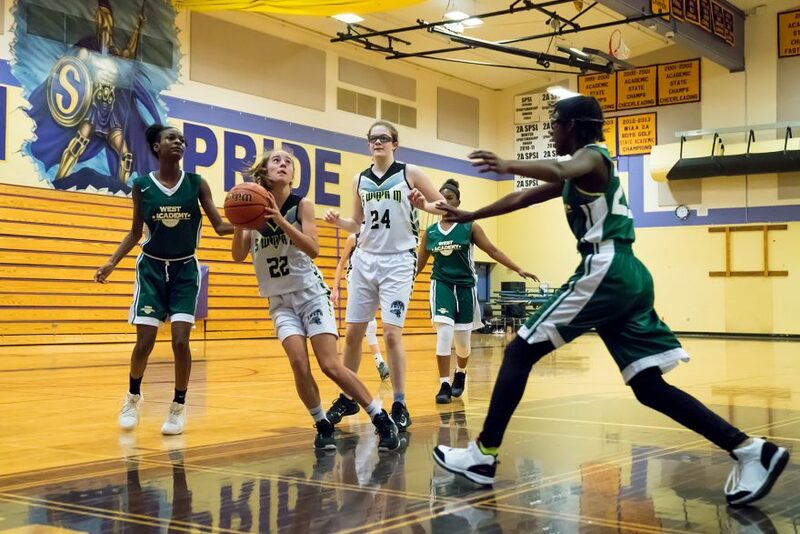 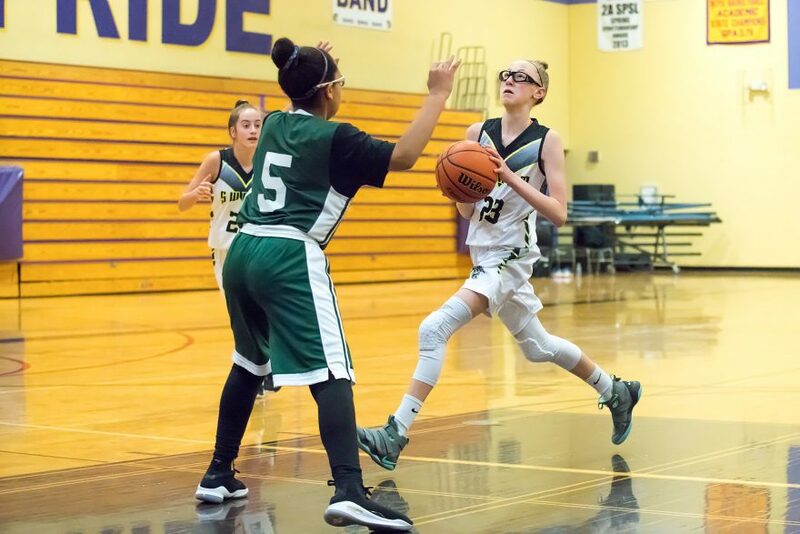 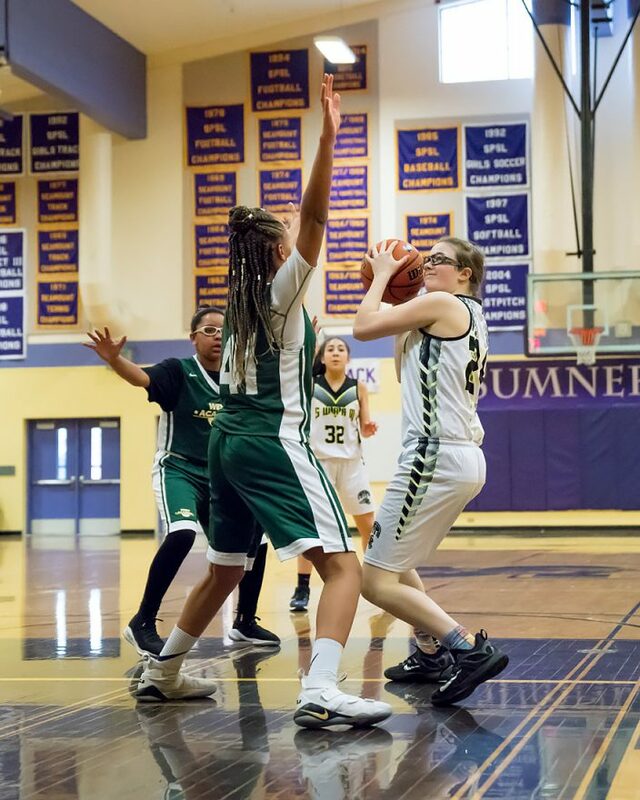 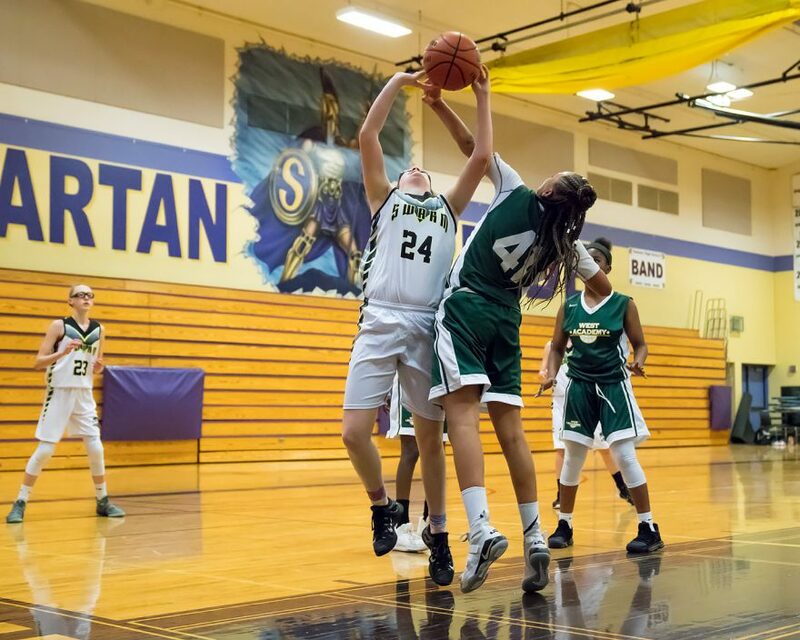 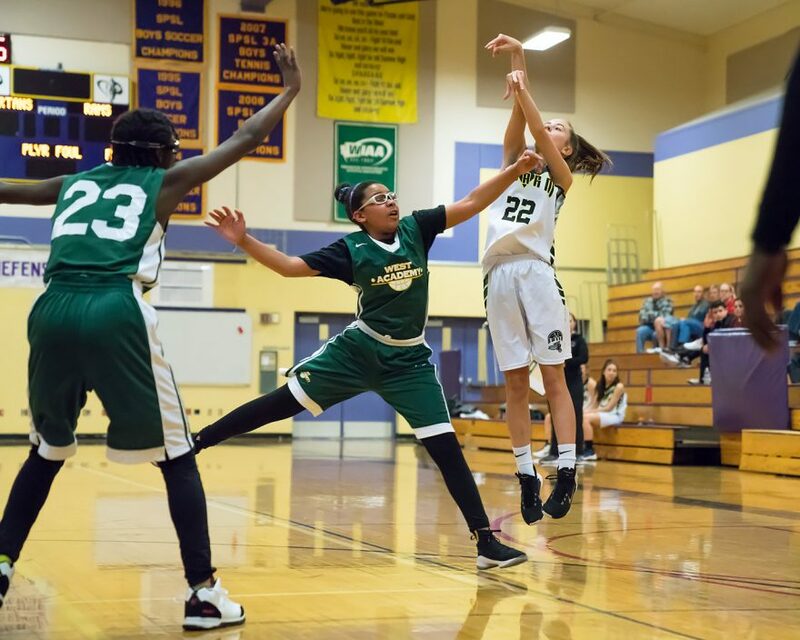 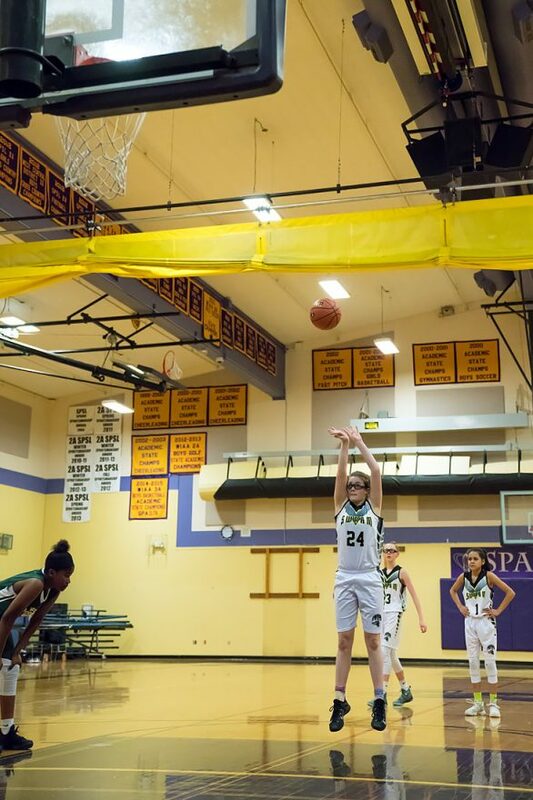 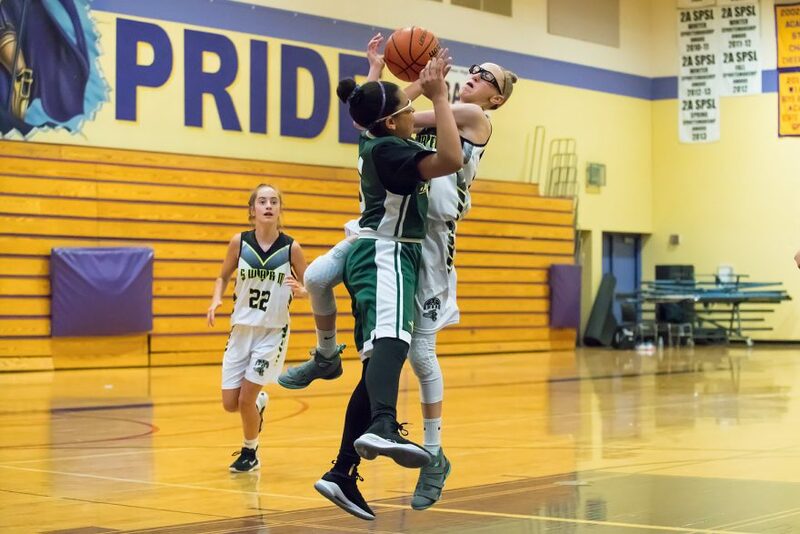 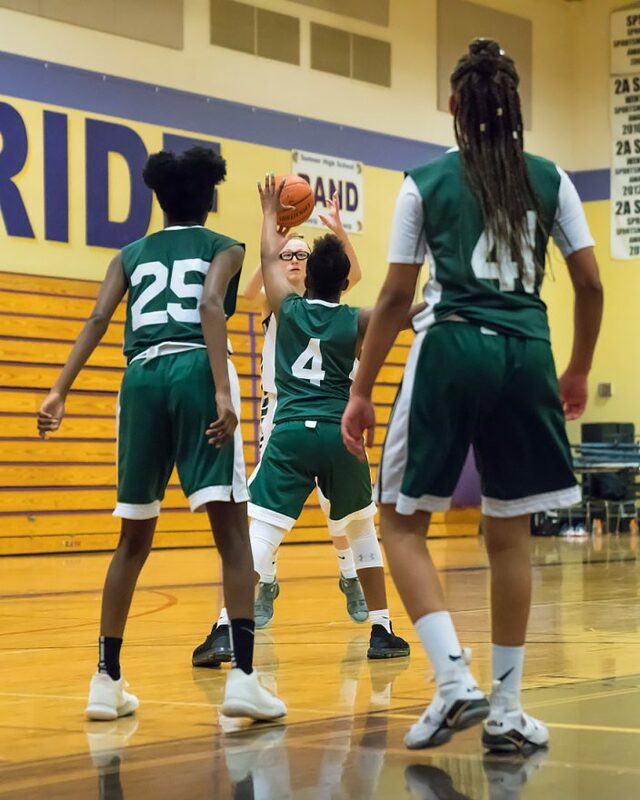 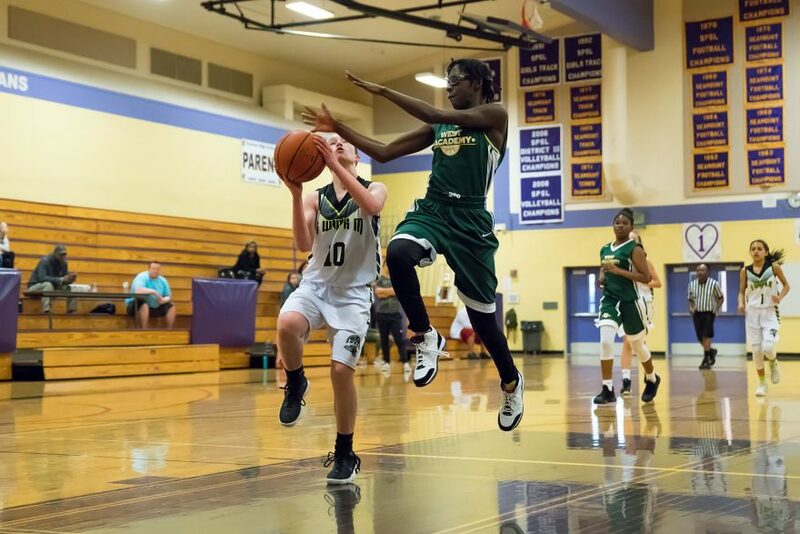 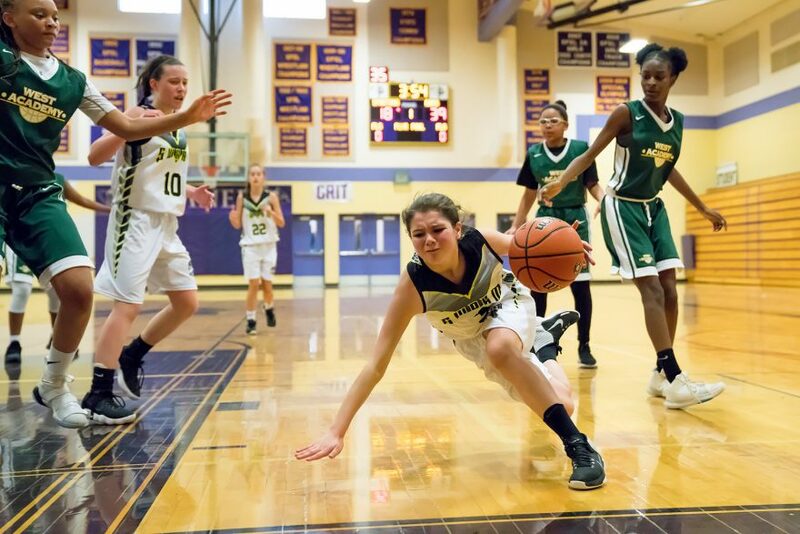 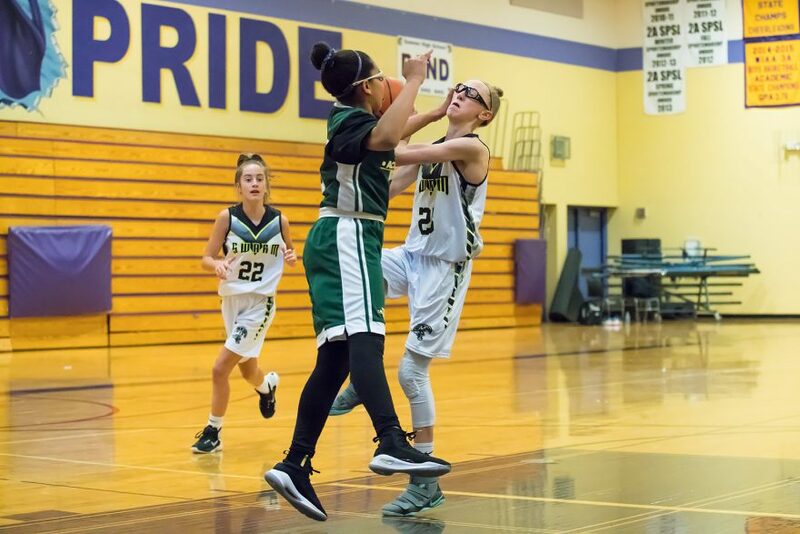 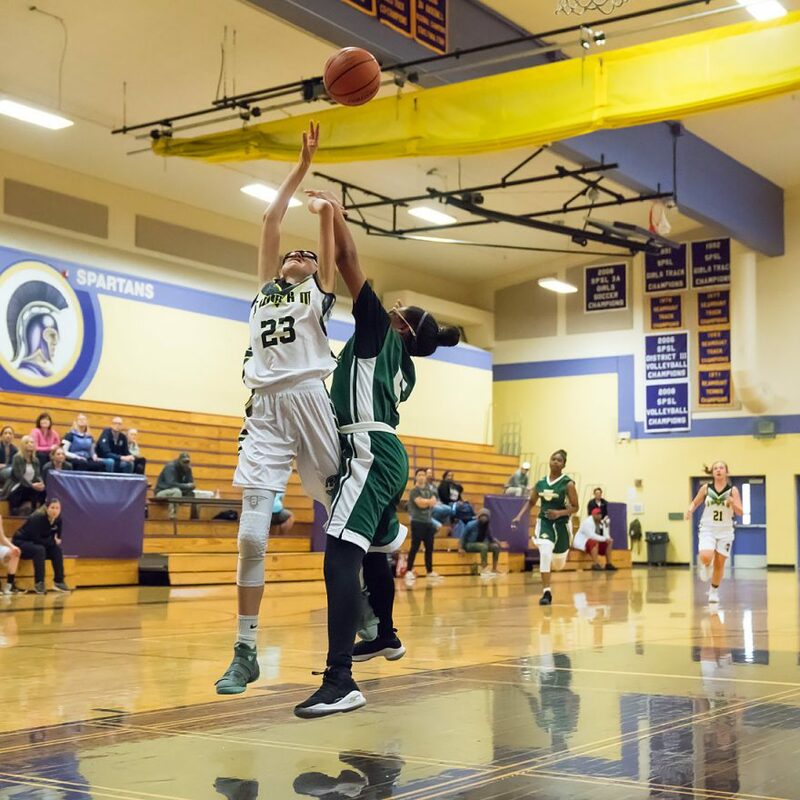 In the opening minutes of Sunday afternoon’s game at Sumner High, before the score keepers had even figured out how to add points to the scoreboard, the Swarm jumped out to a 4-0 lead against the girls of WEST Academy. 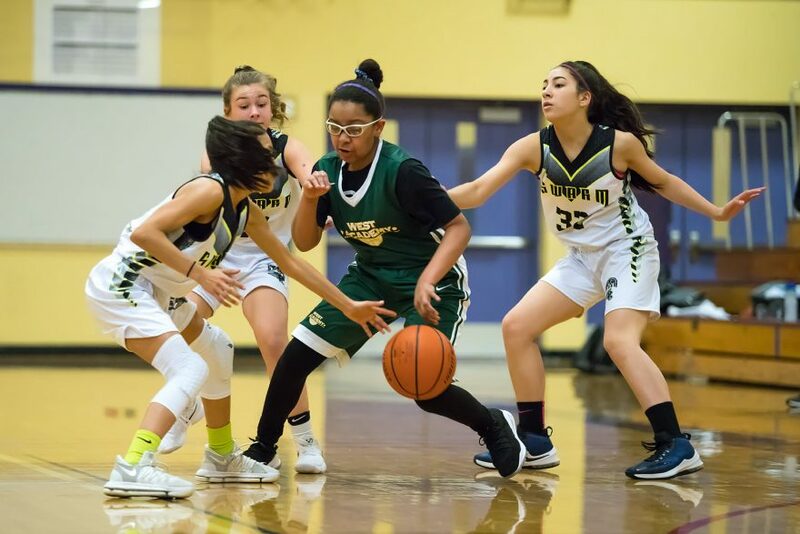 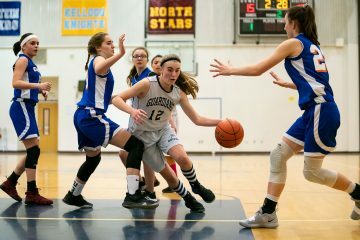 However, WEST quickly regrouped and formed a stout, physical defense holding the Swarm scoreless for the next five minutes, while sinking their own two free throws. 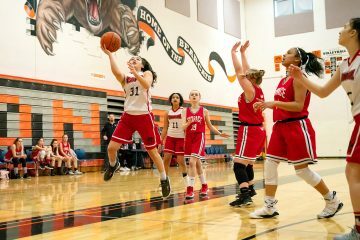 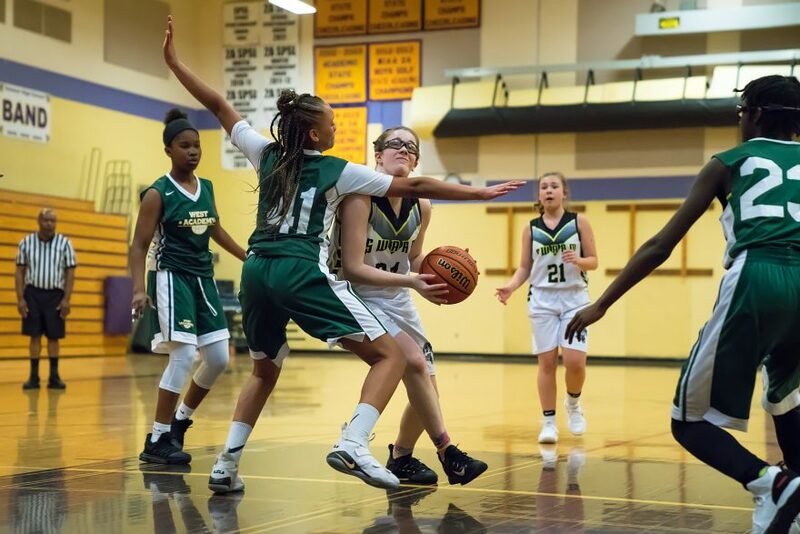 (4-2)Once their opponents were on the board, though, the Swarm attacked with renewed energy, quickly sinking a pair of long jump shots to make the score 8-2. 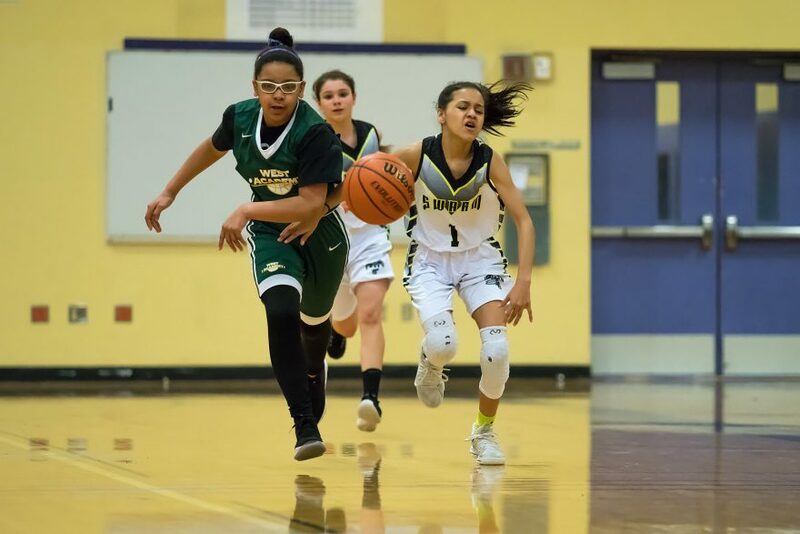 Almost halfway though the period, the gap had increased to 10-2, and it looked like the game might become a rout until WEST suddenly turned the game around. 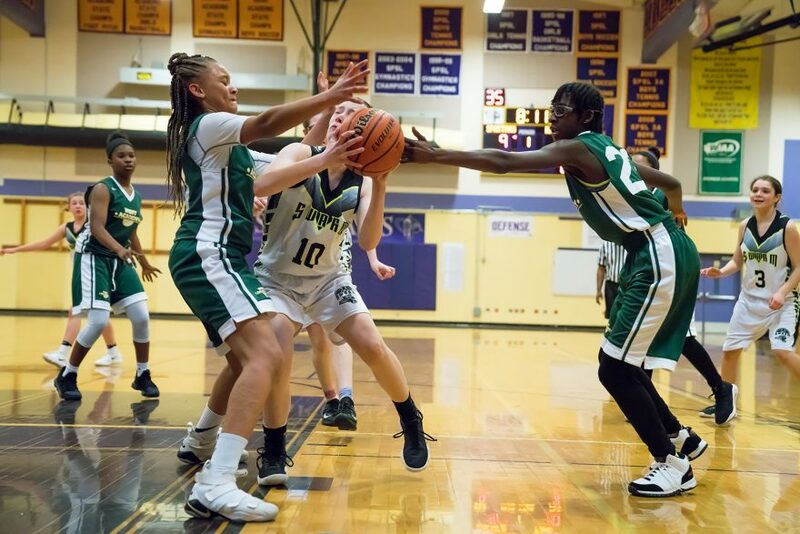 After starting with an easy layup (and a collection of missed shots by the Swarm), the WEST finished a seven point run with a deep three-pointer (10-9). 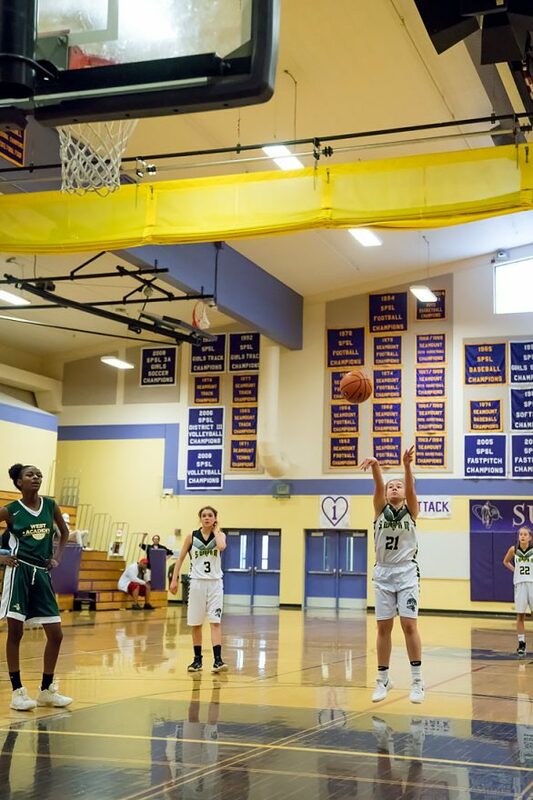 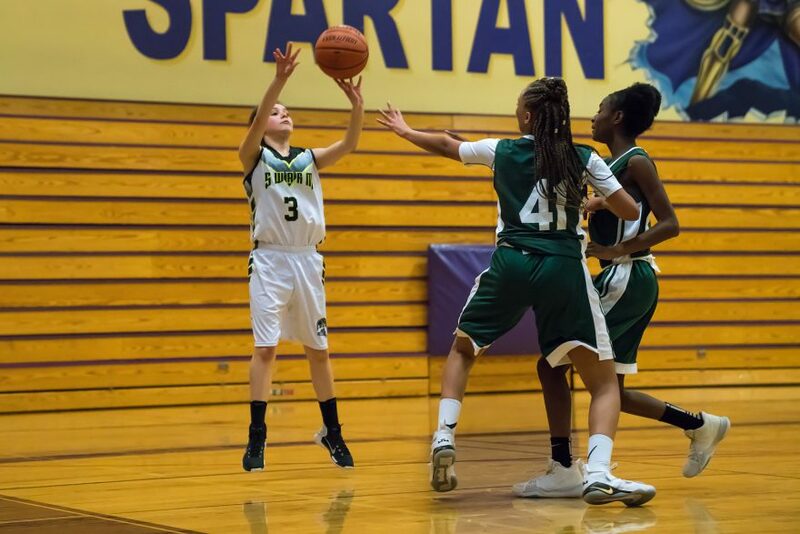 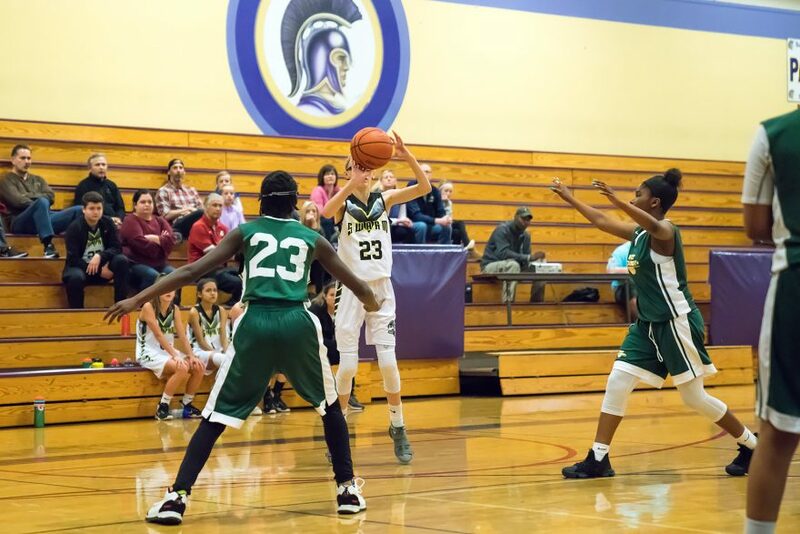 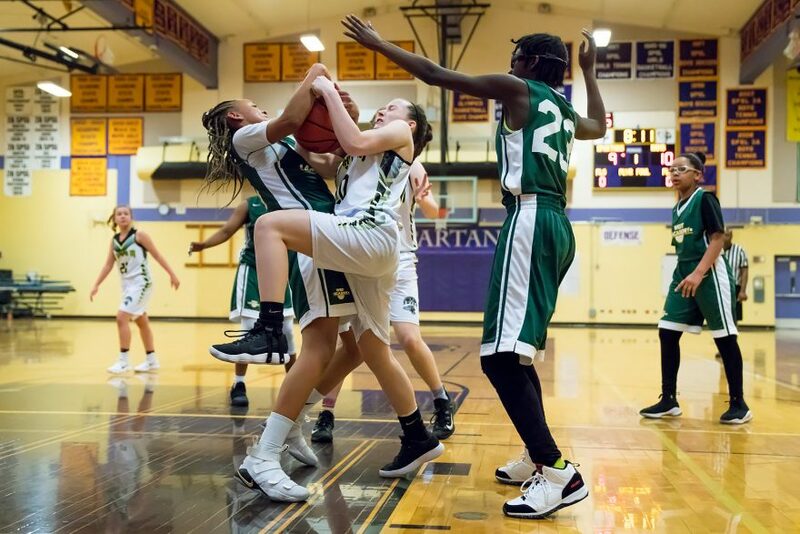 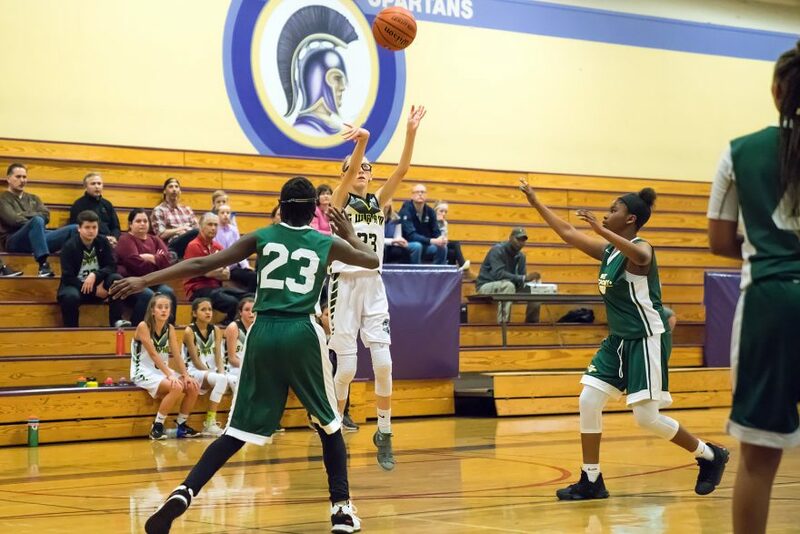 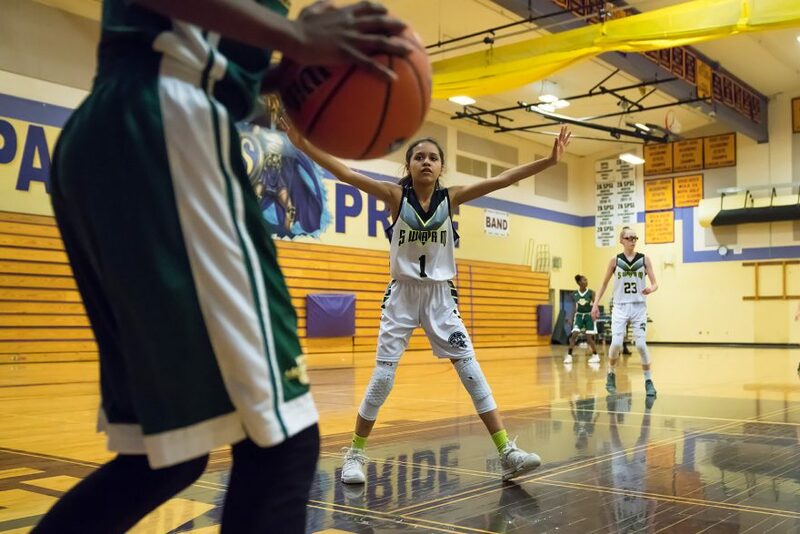 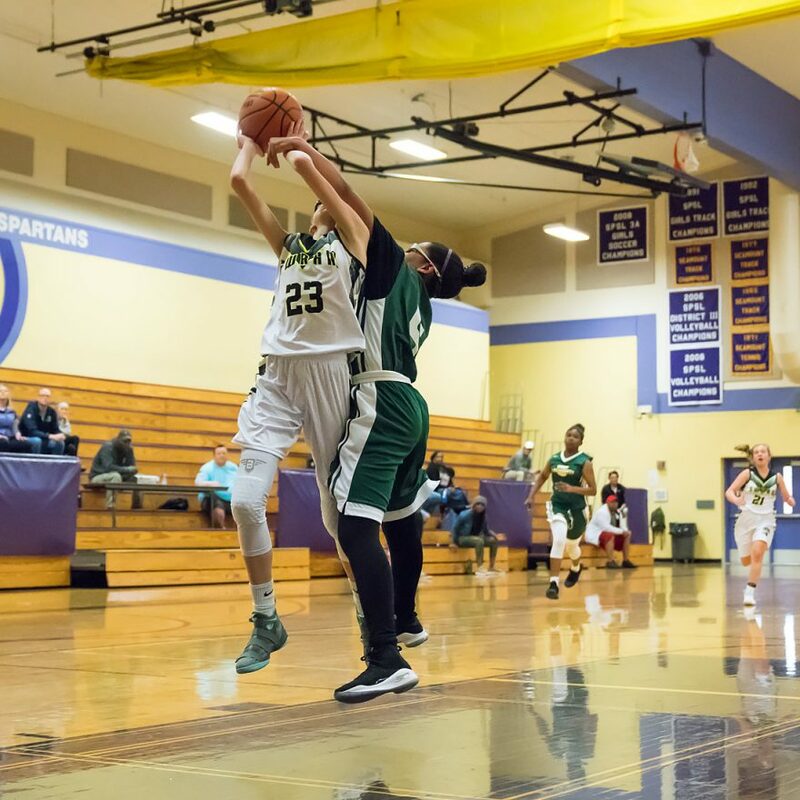 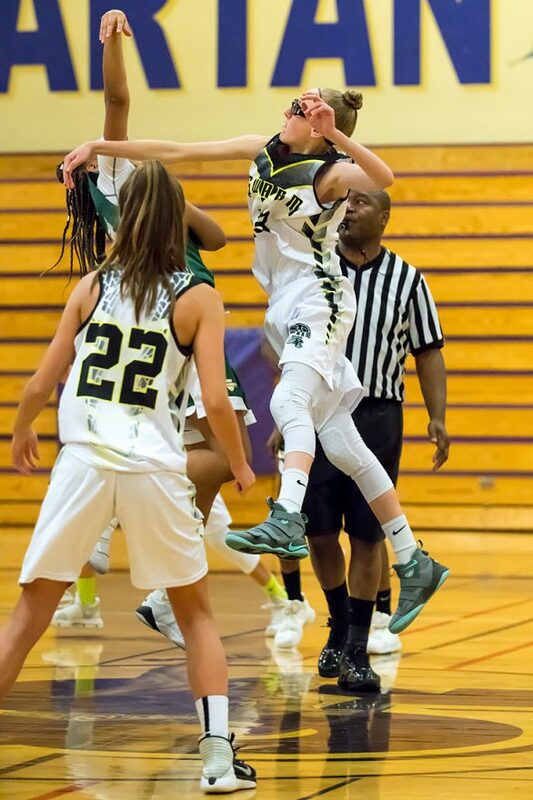 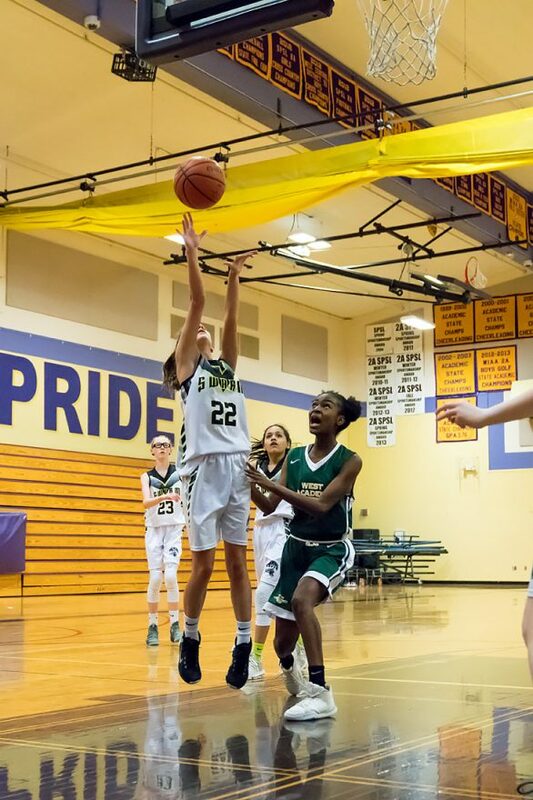 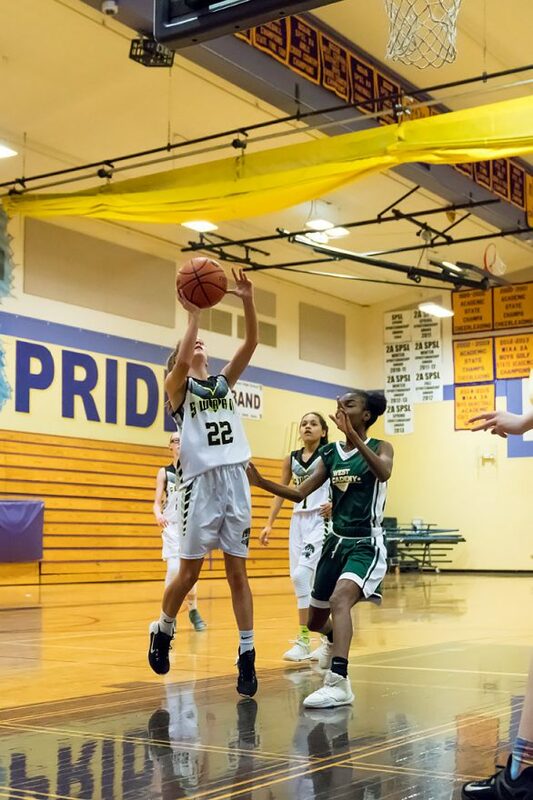 But the Swarm’s #23 answered with her own 3-pointer, and the tide turned once more. 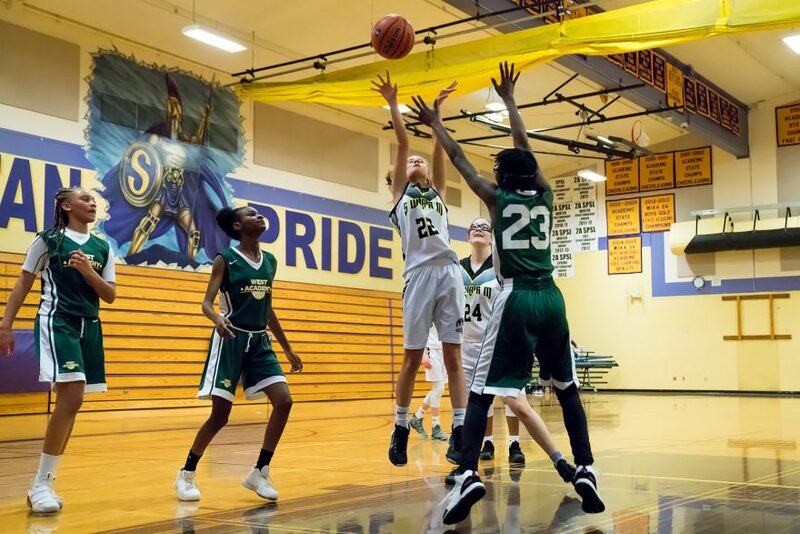 After a brutal battle in the paint and a free-throw (#24), and another 18-footer (#1), the Swarm were once ahead again by eight points, and another layup moments later (#23) made it ten at 19-9. 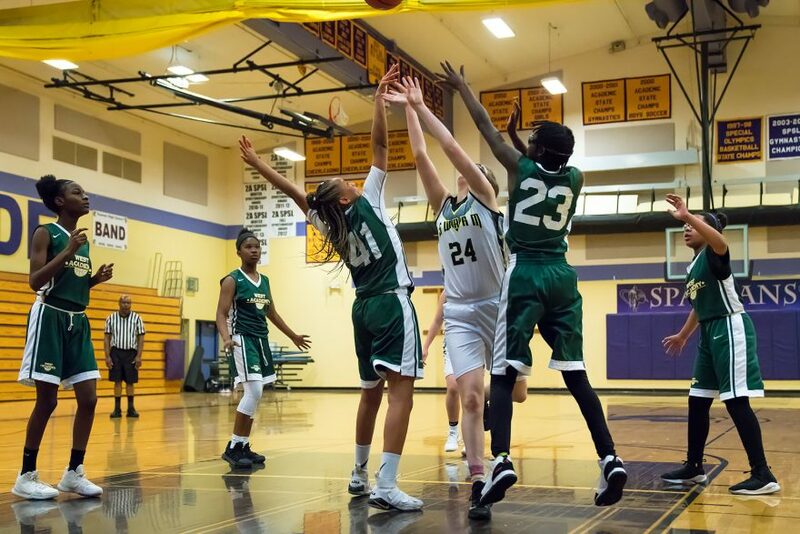 Though WEST academy hit a free throw, the Swarm did not relent, closing the half with another 18-footer from the top of the key (#23), making the score of 26-10. 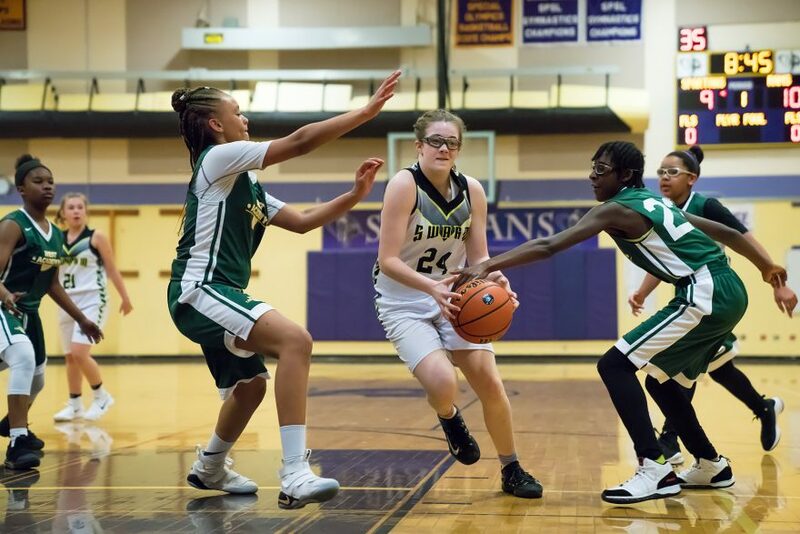 Scoring early in the second half was much more even, with the Swarm adding three points early, followed by WEST Academy adding four. 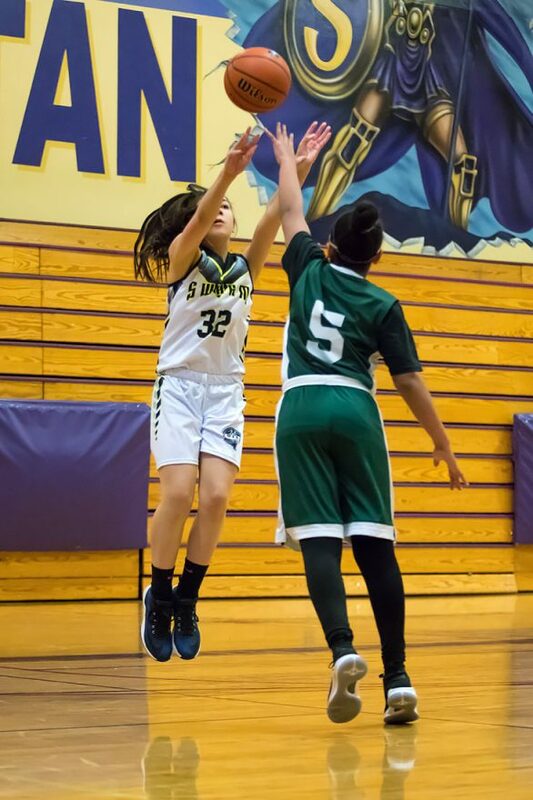 Halfway through the period, scoring was still virtually even (34-17). 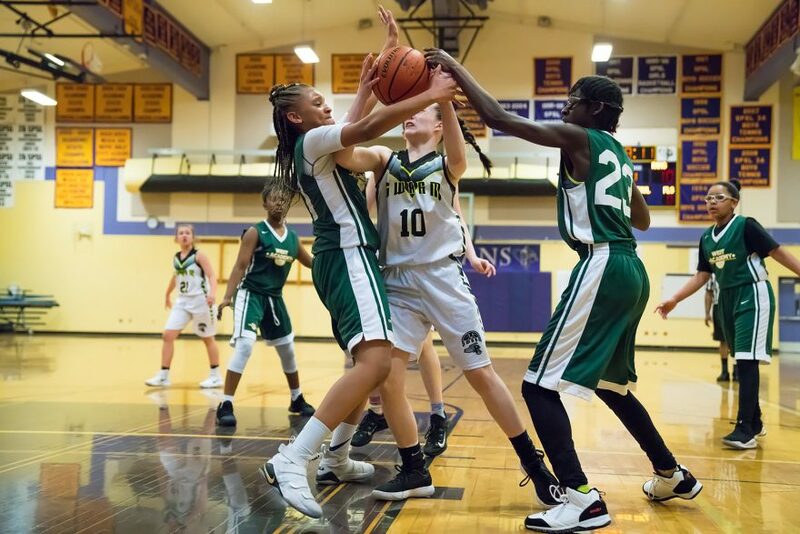 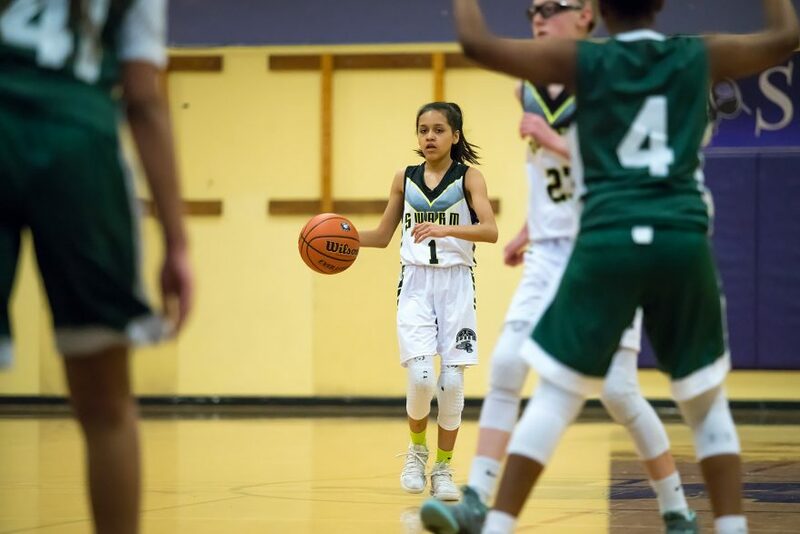 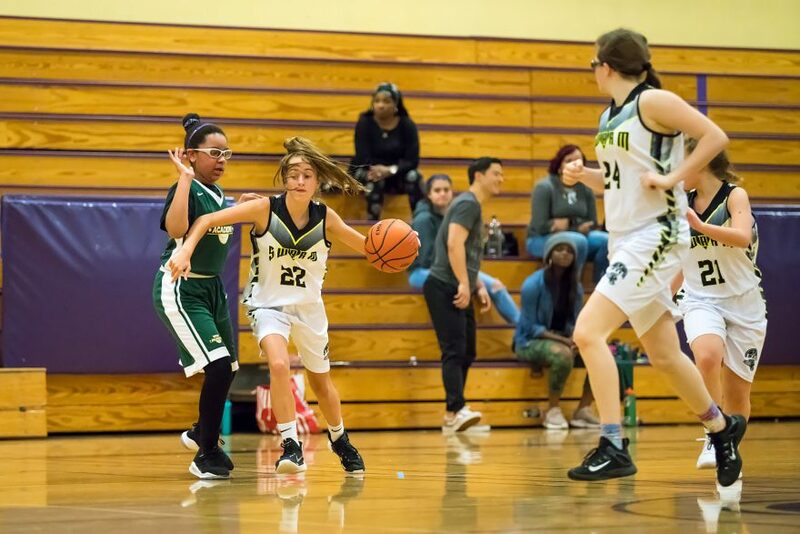 In the final quarter of the game, though, the Swarm began pulling steadily ahead, increasing their lead to 21 points with five minutes remaining, and holding their lead for the remainder of the game. 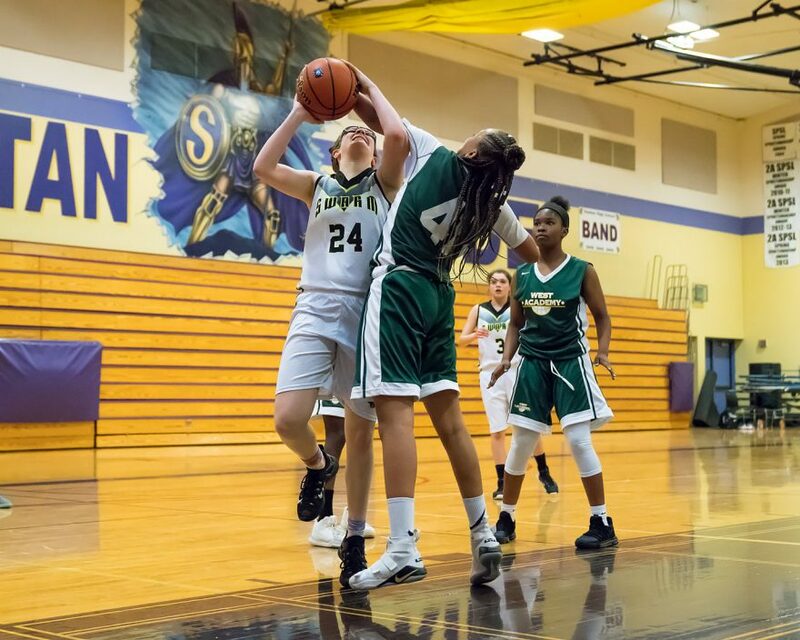 Final Score: 43-22, Swarm.